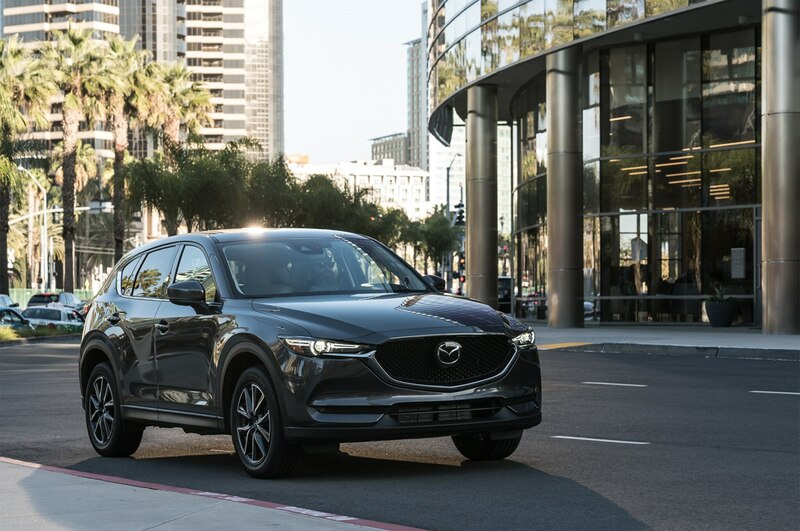 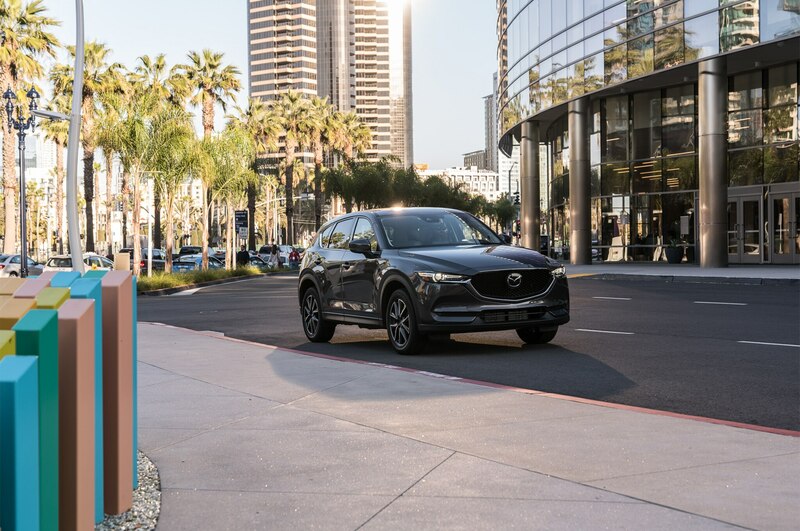 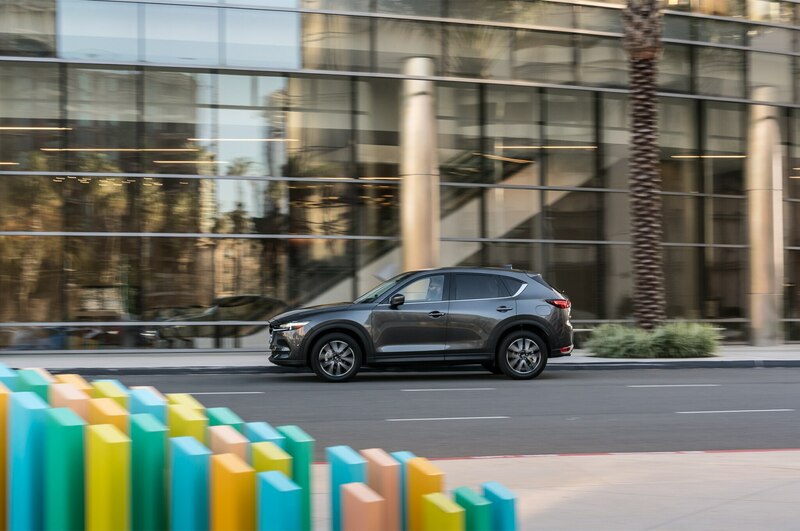 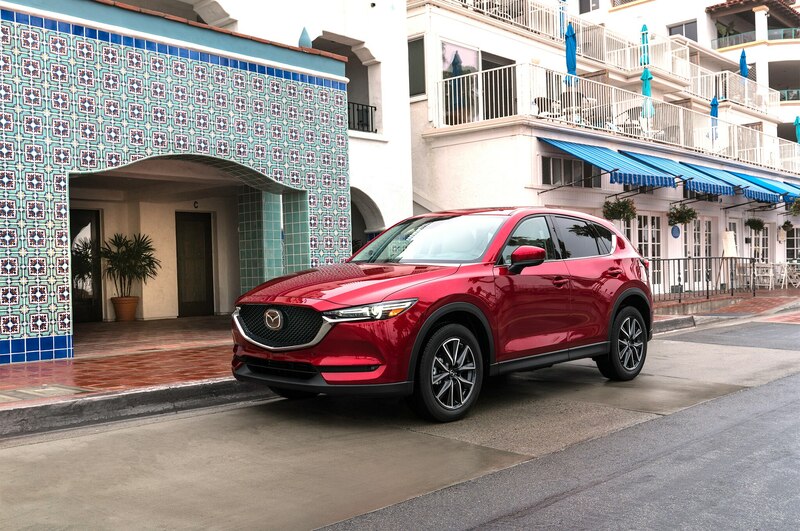 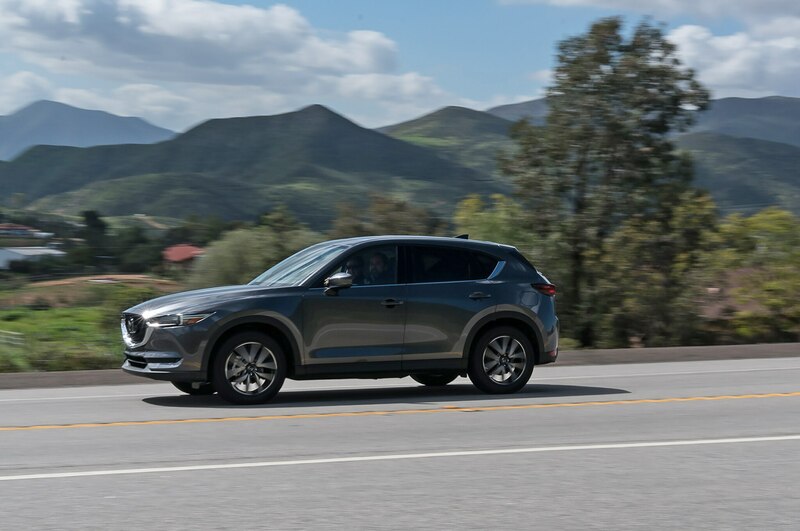 SAN DIEGO, California — Last year was a tough one for Mazda, which saw its sales dip 6.7 percent year-on-year even as the industry as a while posted record numbers. 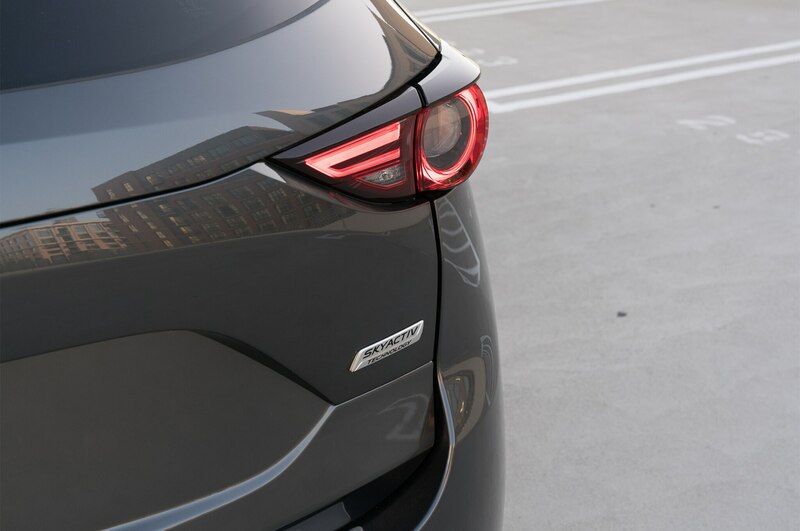 The culprit? 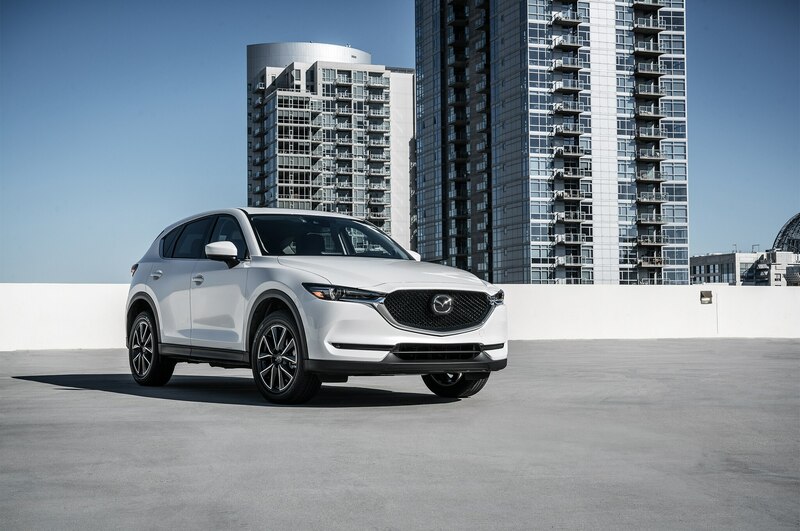 Sharp declines in the popularity of its cars, a phenomenon that has affected a number of automakers as buyers continue to shift towards crossovers. 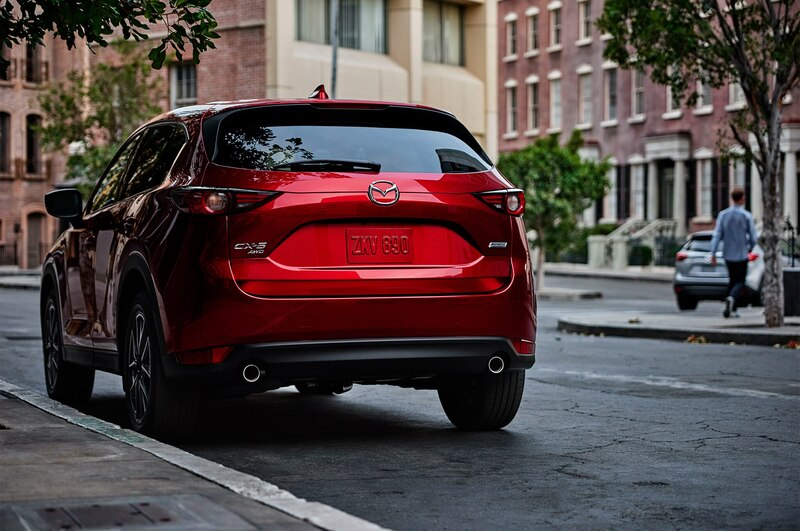 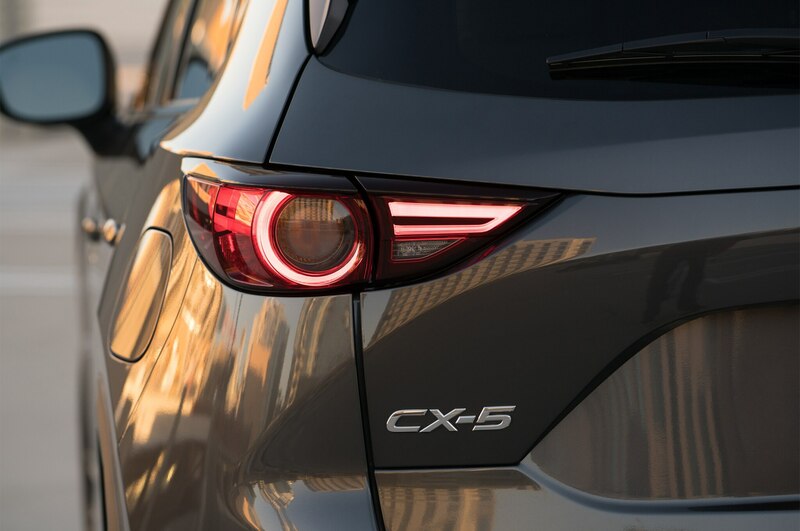 So not surprisingly, one bright spot in the Mazda lineup in 2016 was the CX-5, which remained the brand’s No. 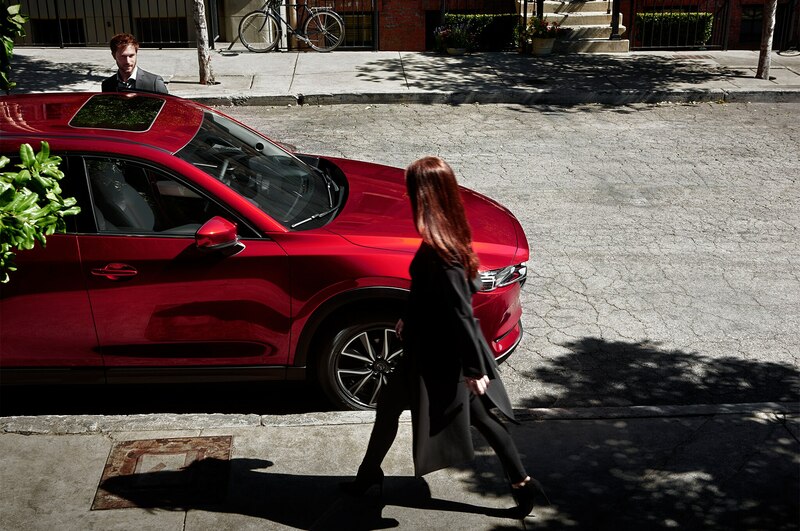 1 selling model, accounting for a whopping 38 percent of U.S. sales. 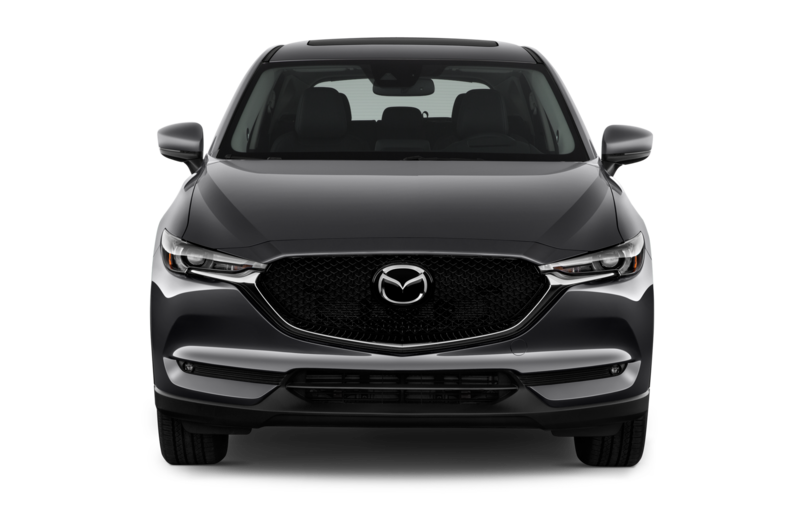 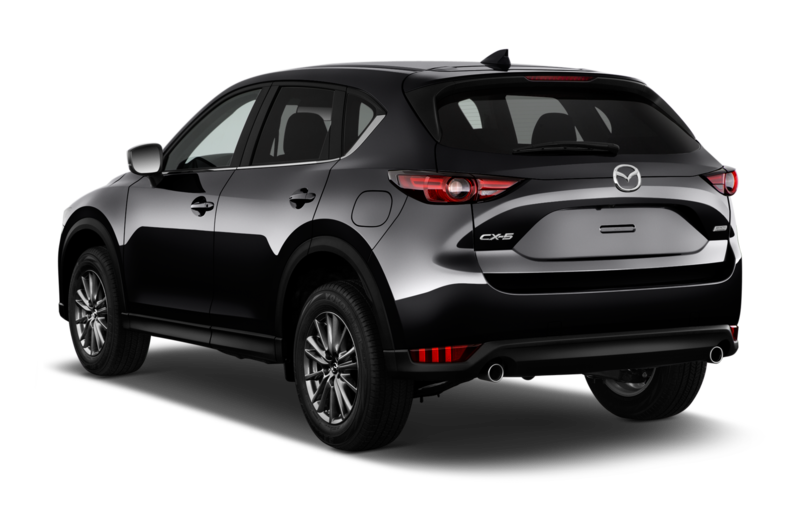 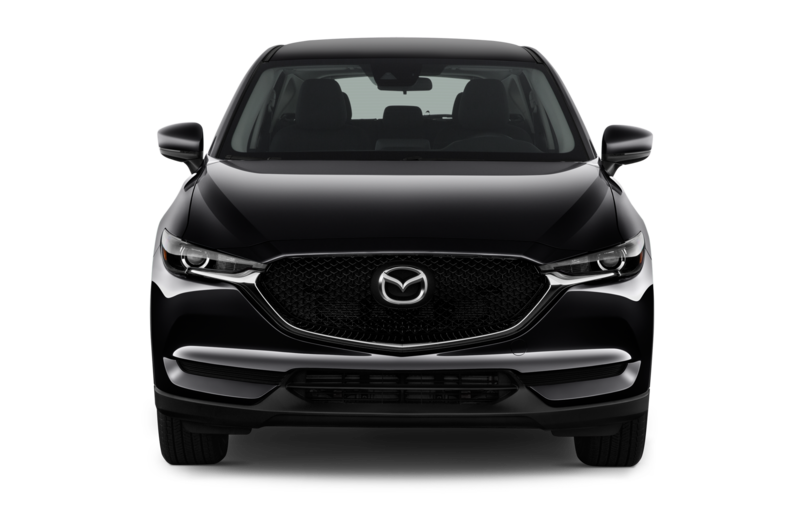 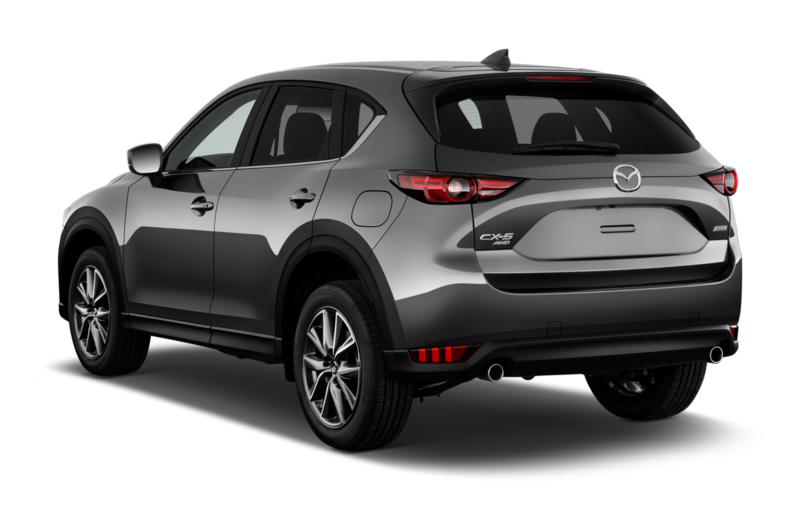 As such, it’s not hyperbole to say that the all-new 2017 Mazda CX-5 is the most important vehicle the brand will be launching in the near future. 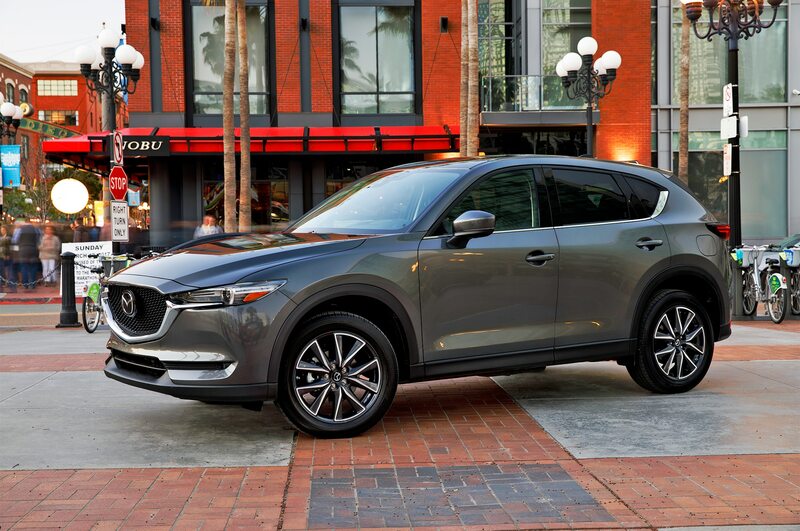 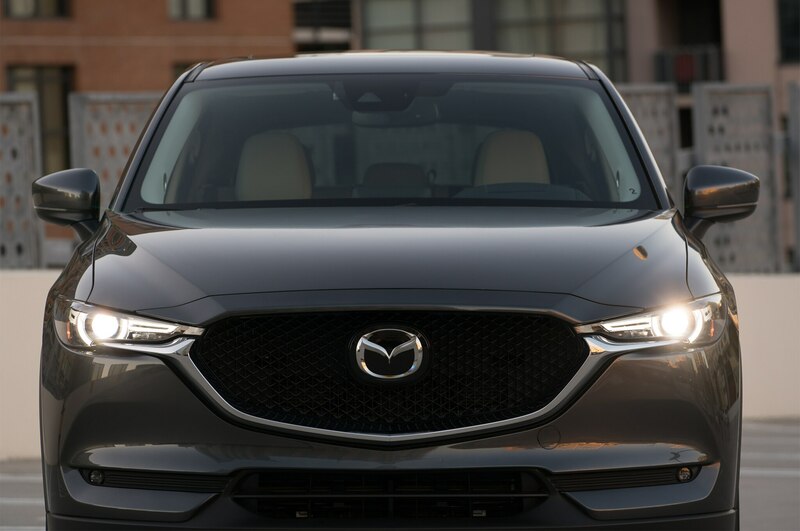 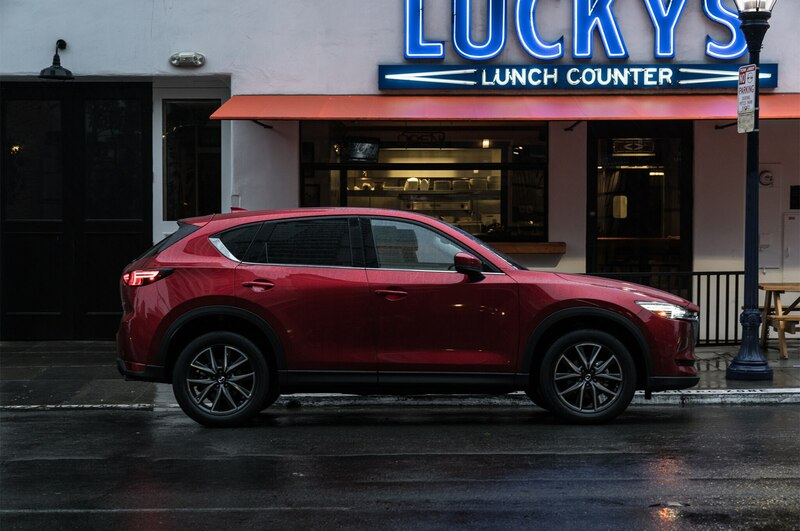 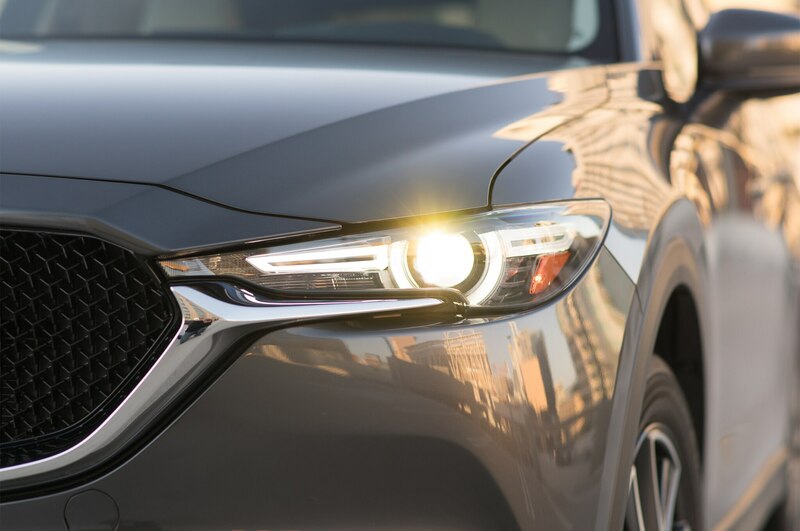 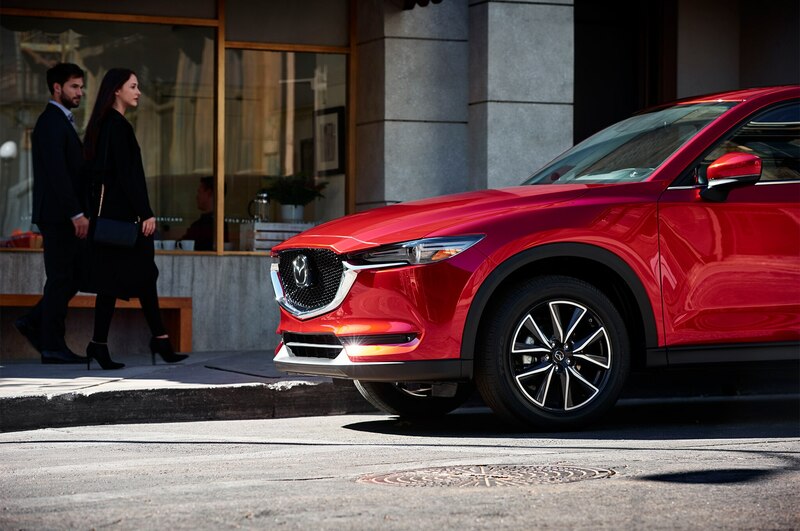 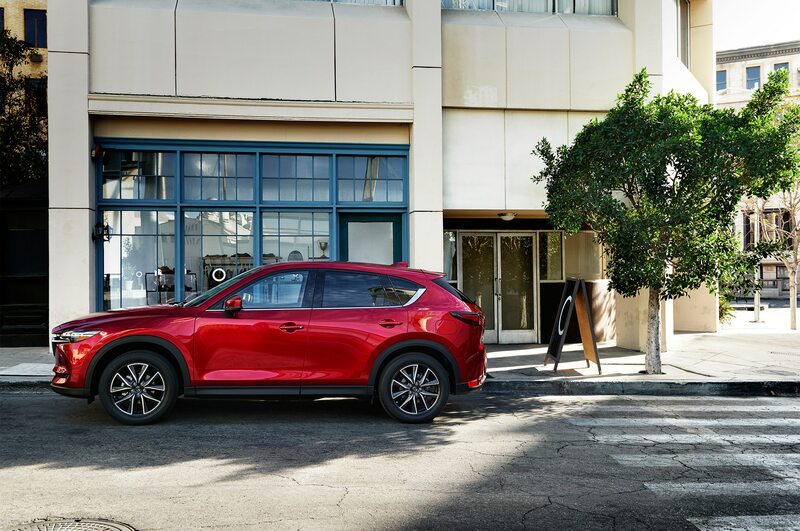 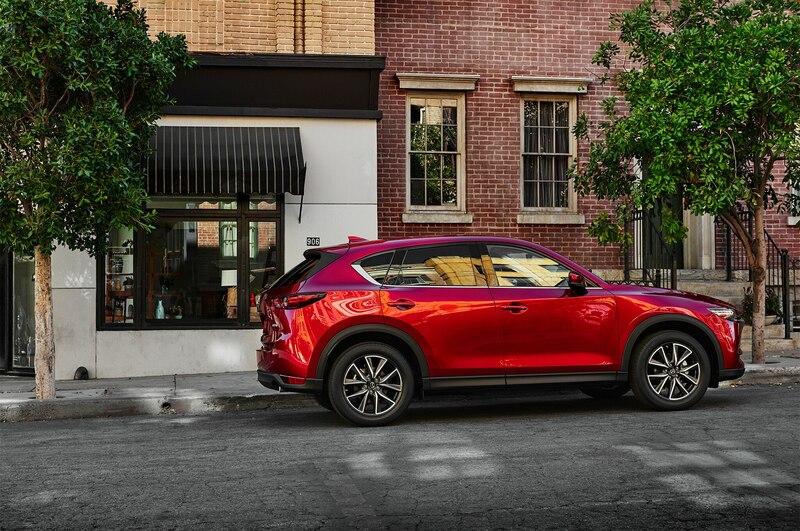 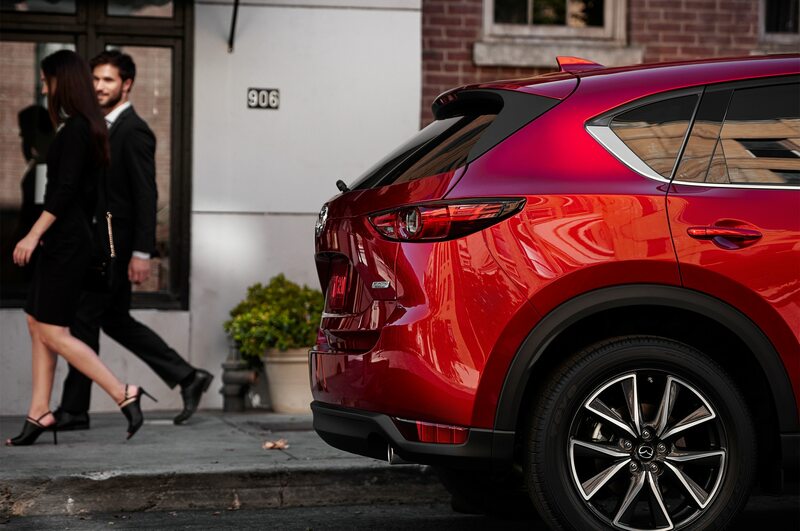 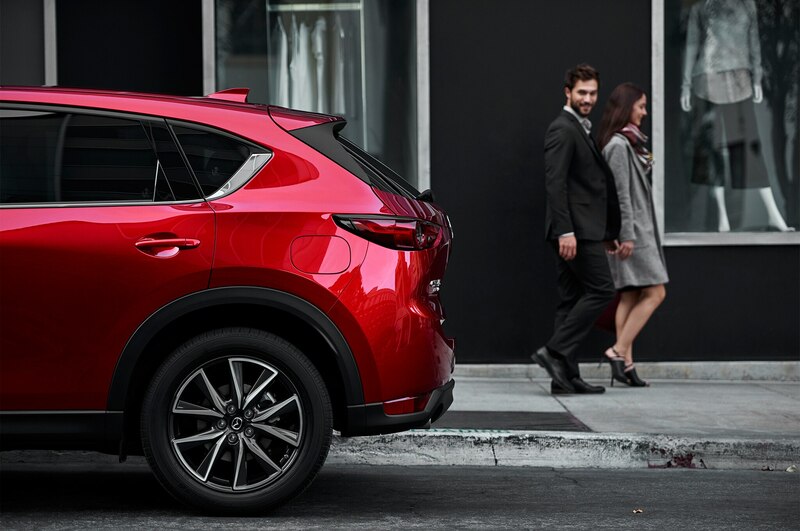 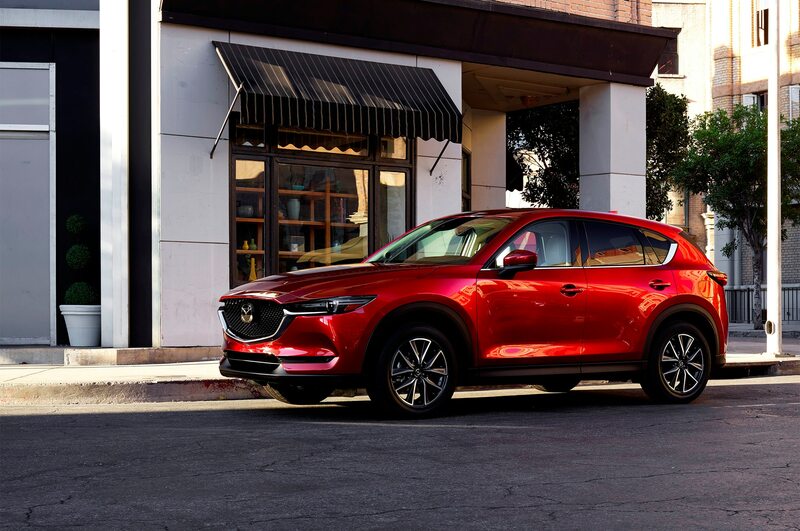 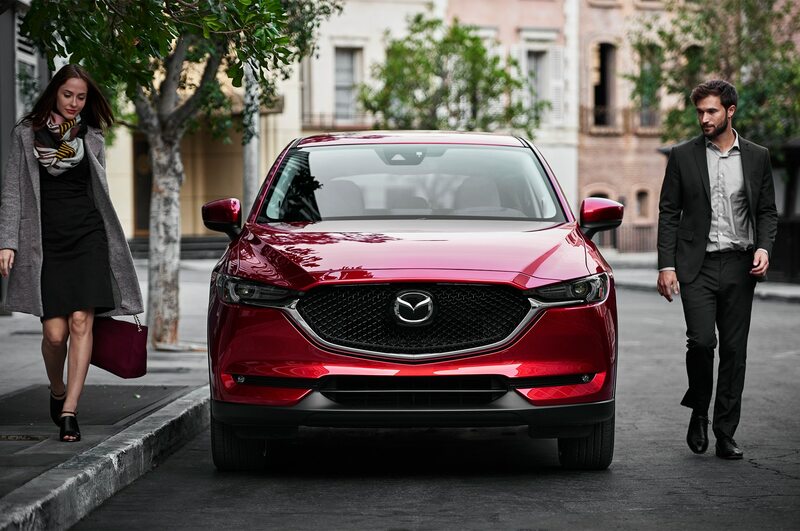 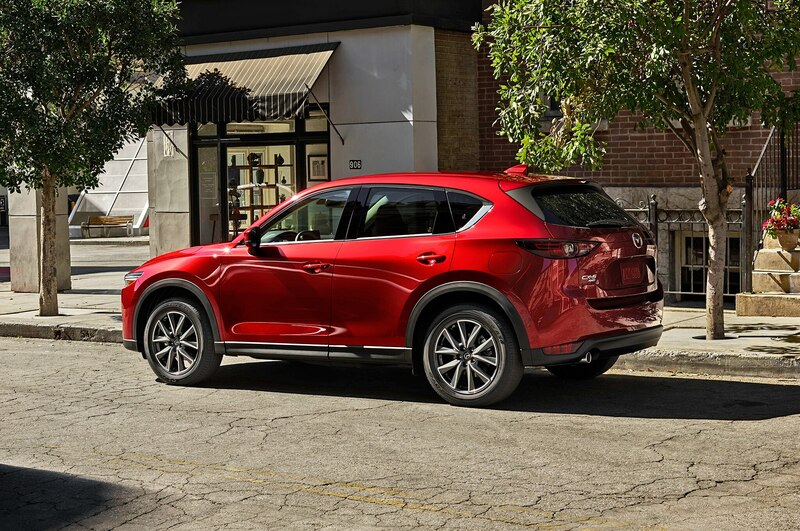 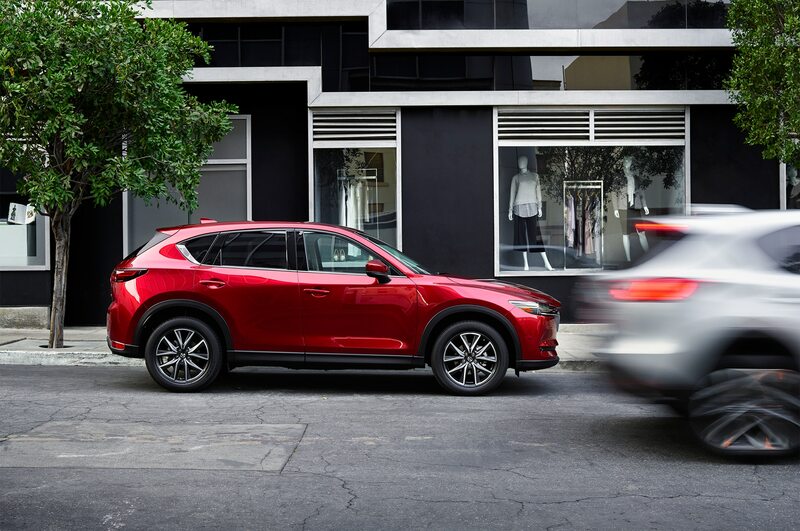 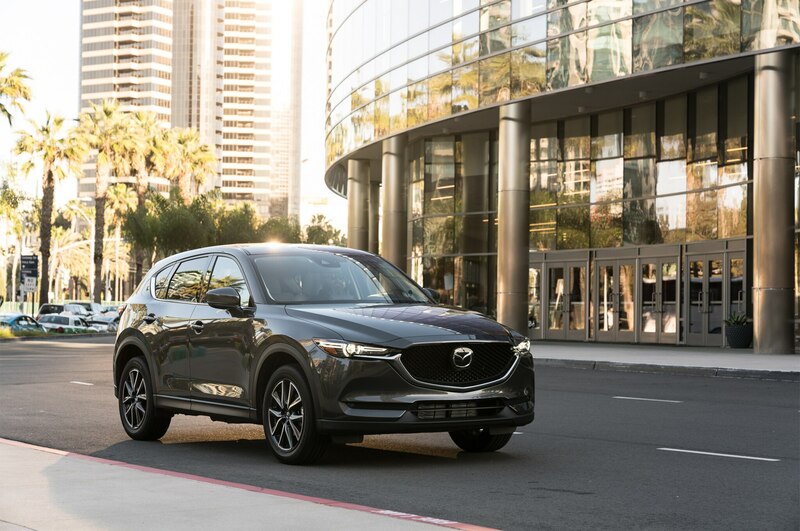 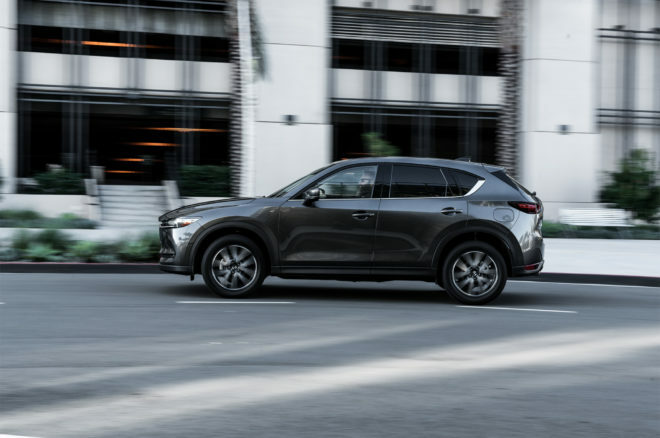 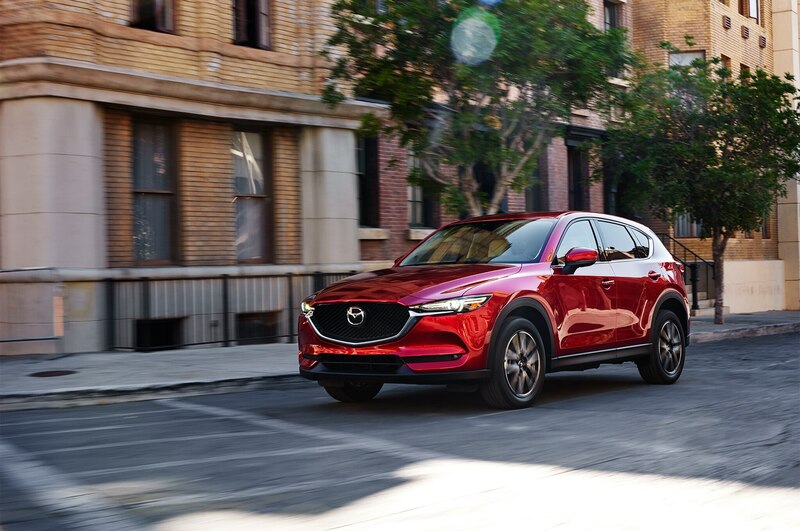 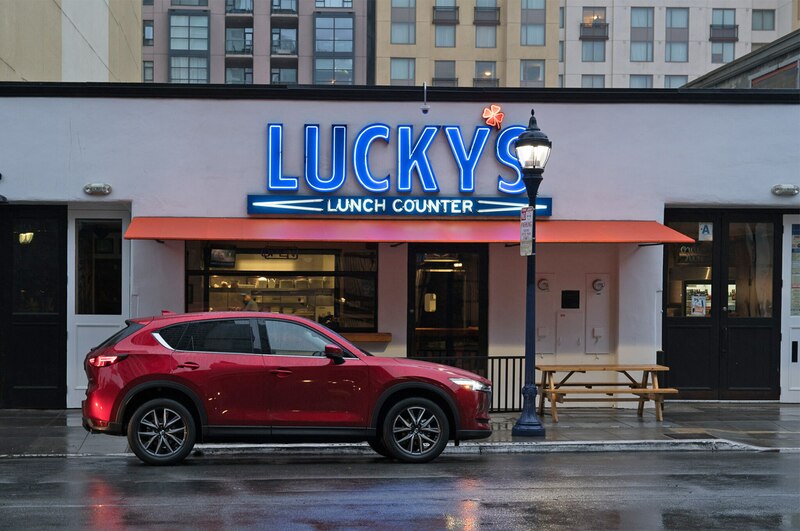 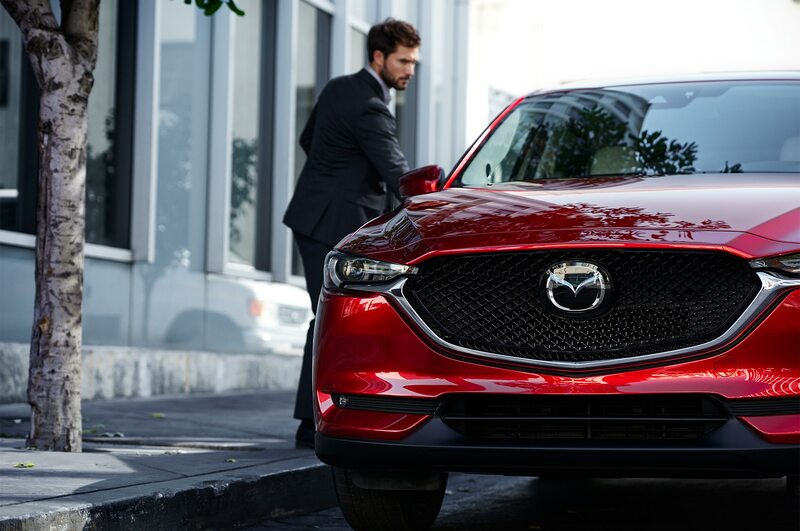 Given our recent experience with the new crossover, which is set to hit dealers shortly, we’re betting Mazda’s accountants and business analysts won’t have too much to worry about. 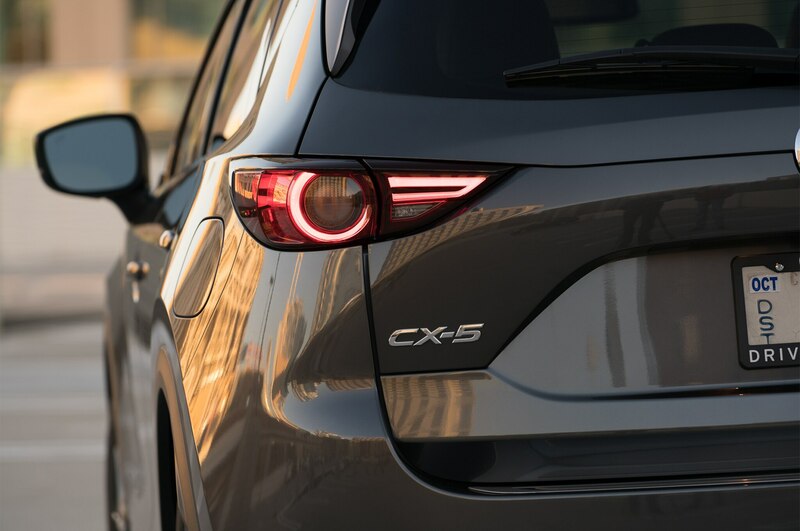 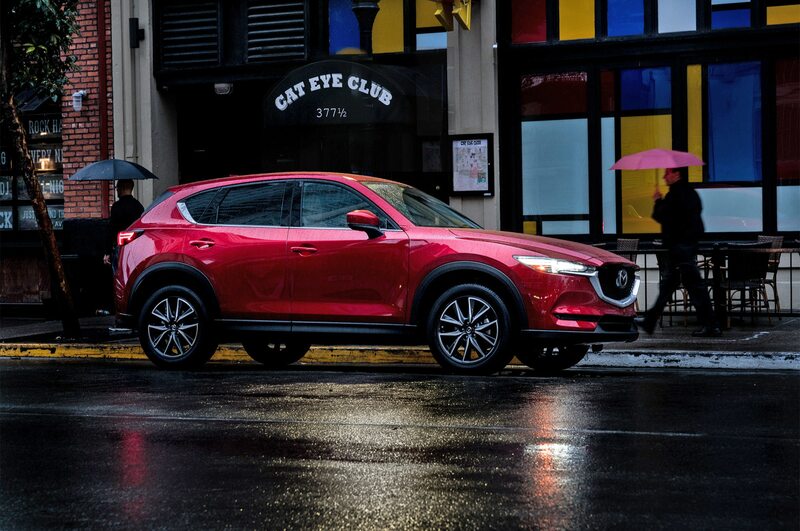 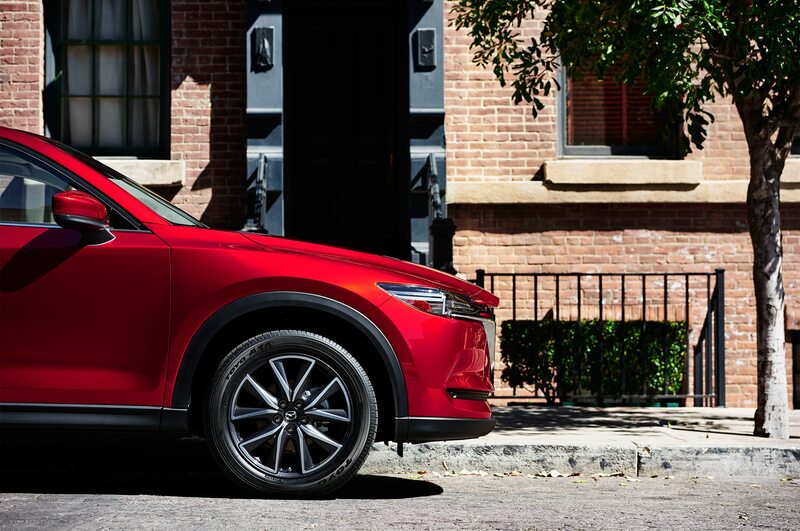 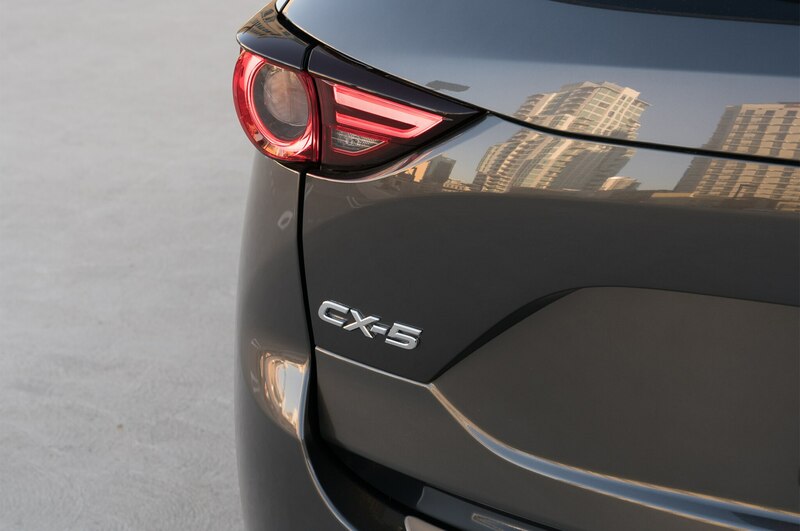 The 2017 CX-5 is an attractive and intelligently engineered crossover that feels more premium than its badge implies, boasting a level of attention to detail not found in most mainstream offerings. At launch, the combination of Mazda’s 2.5-liter Skyactiv I-4 and a six-speed automatic will be the only powertrain offered. 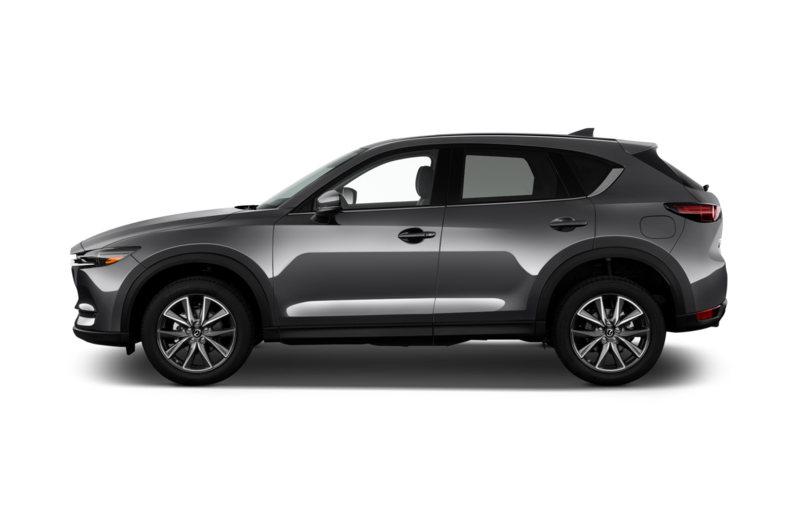 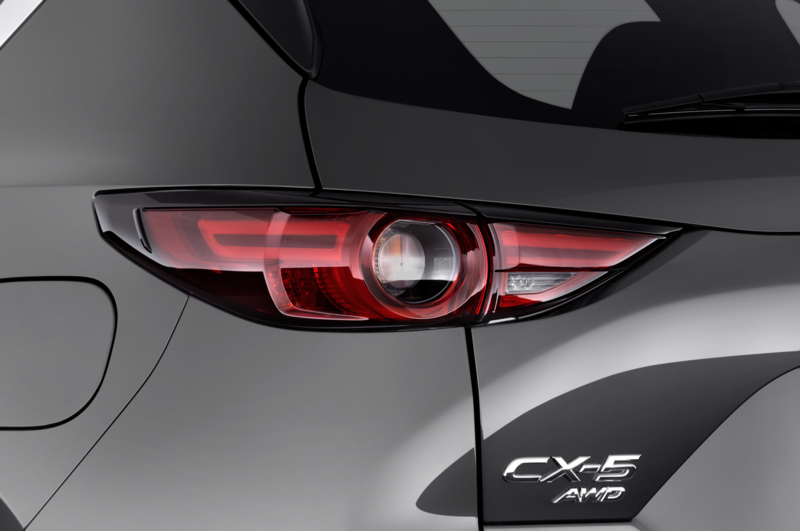 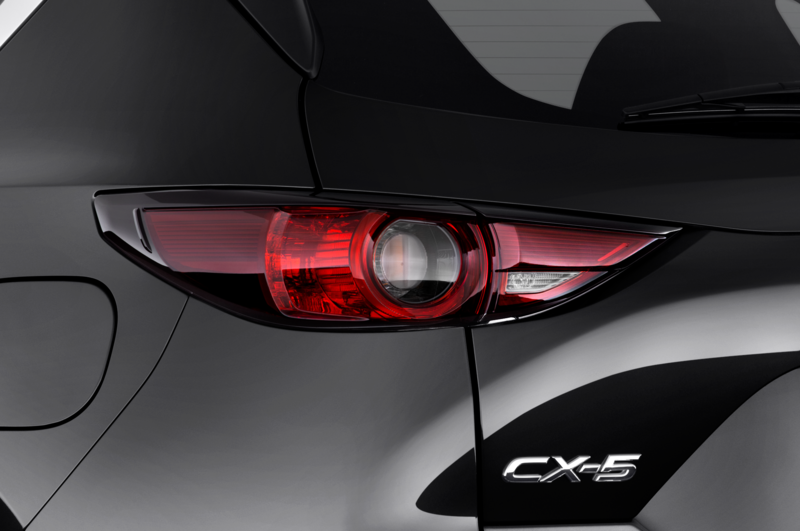 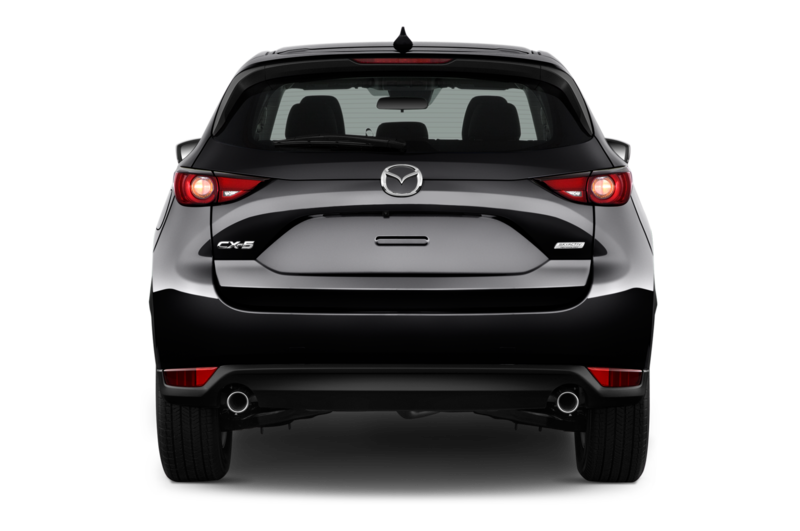 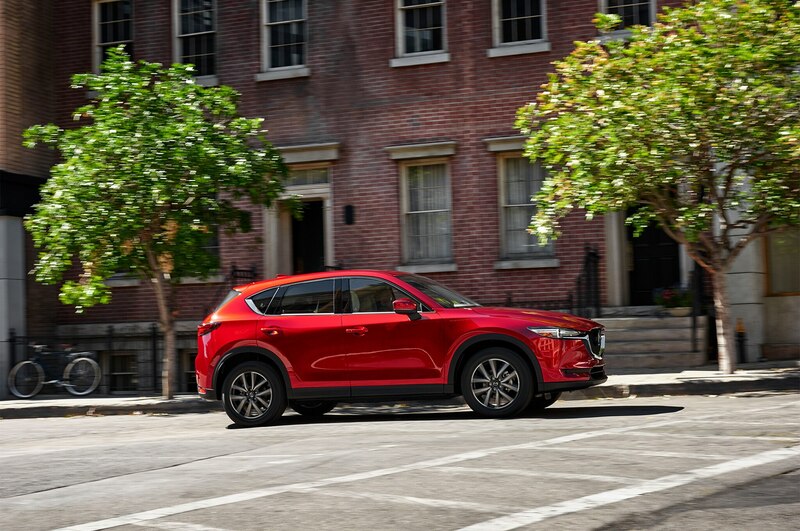 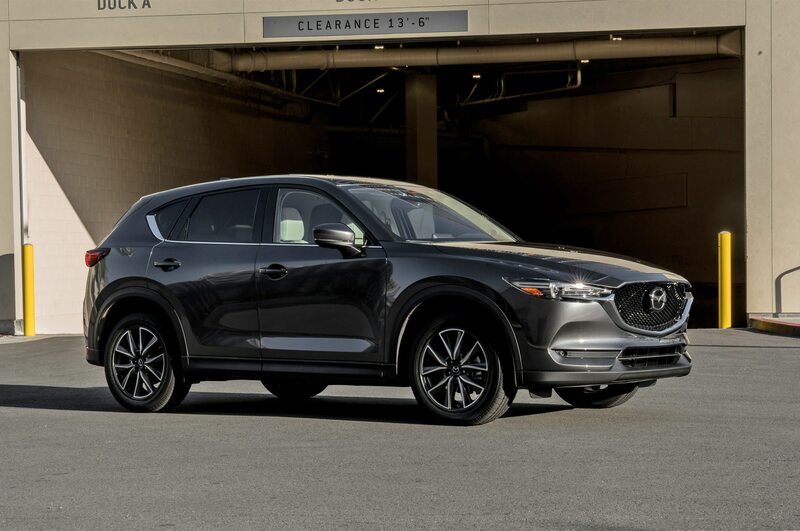 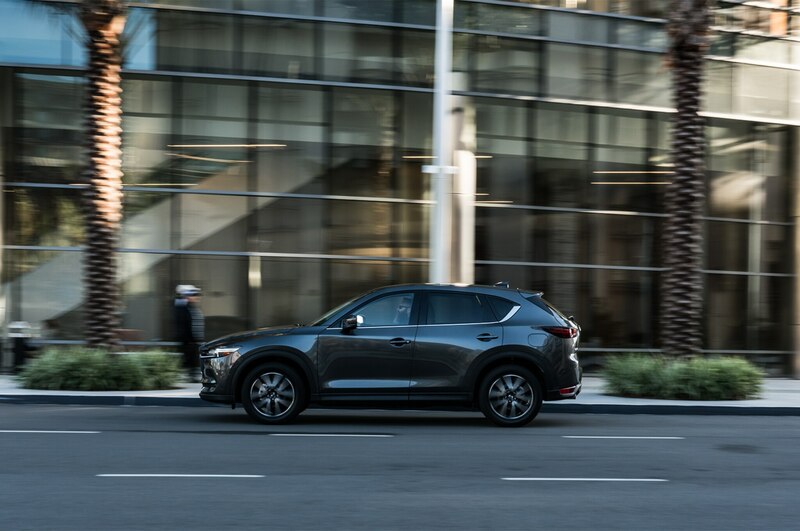 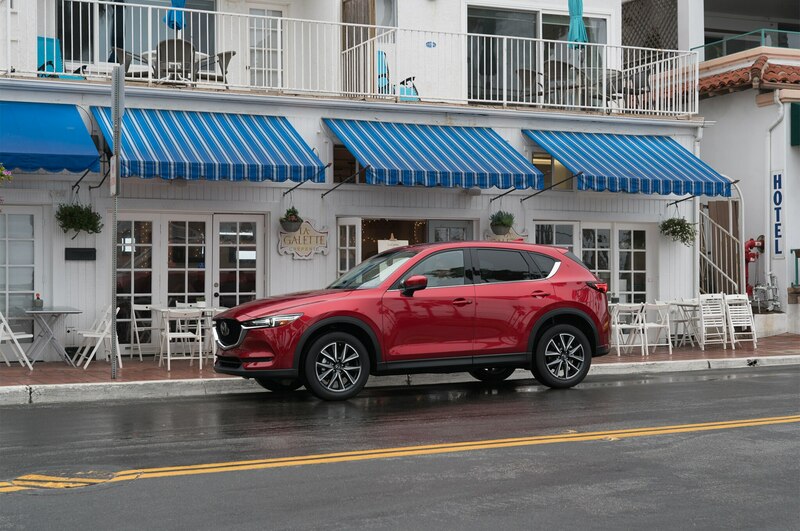 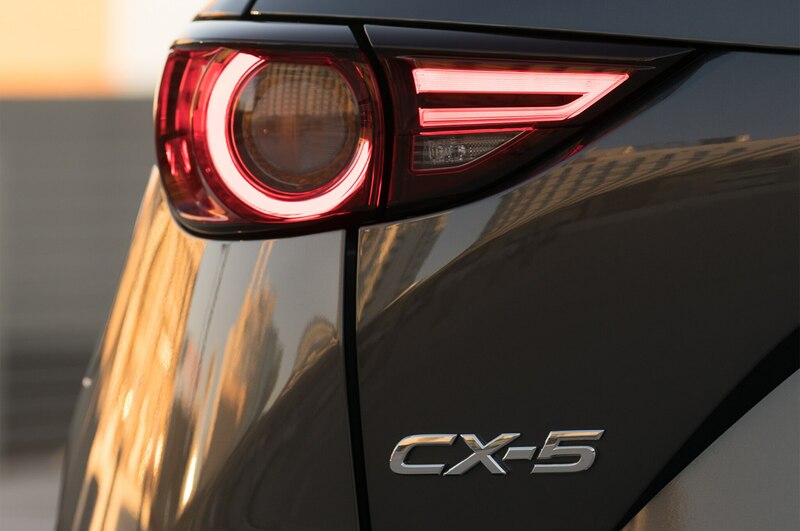 In the 2017 CX-5, it makes 187 hp and 185 lb-ft of torque and can move the 3,600-lb SUV to 60 mph in about 7.8 seconds. 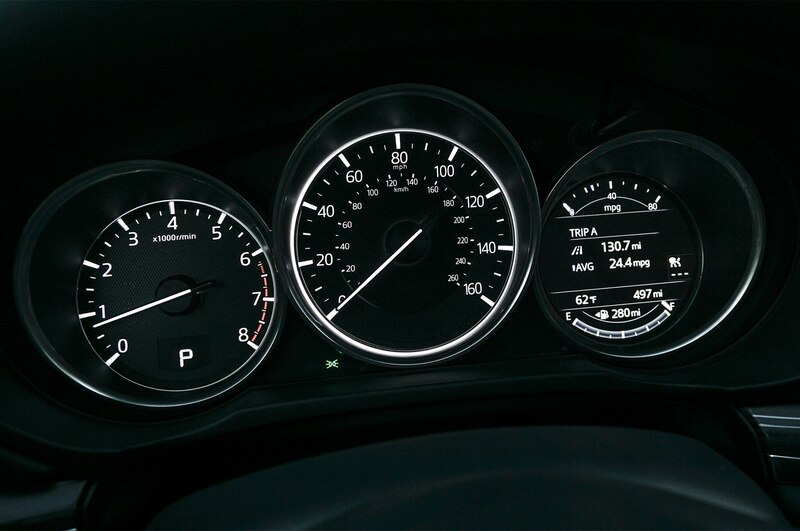 Although its acceleration isn’t exactly spry, throttle response is excellent, with minimal tip-in delay. 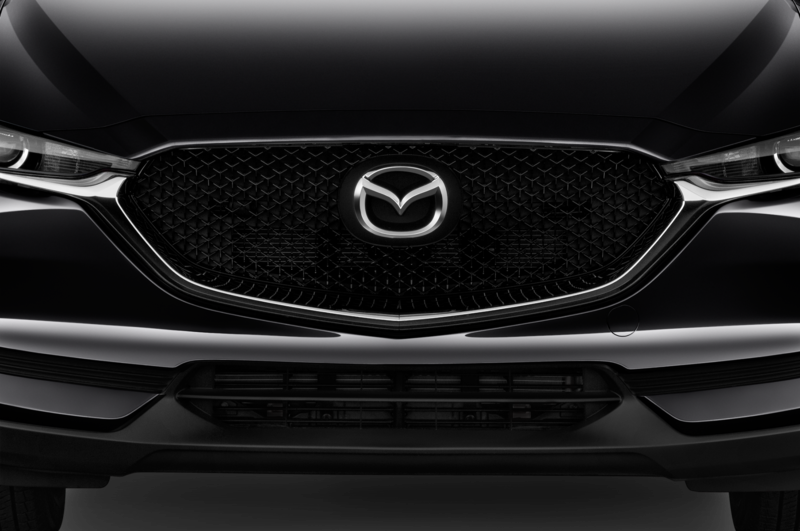 Its power curve is smooth and linear, and the shifts never felt short of cogs. 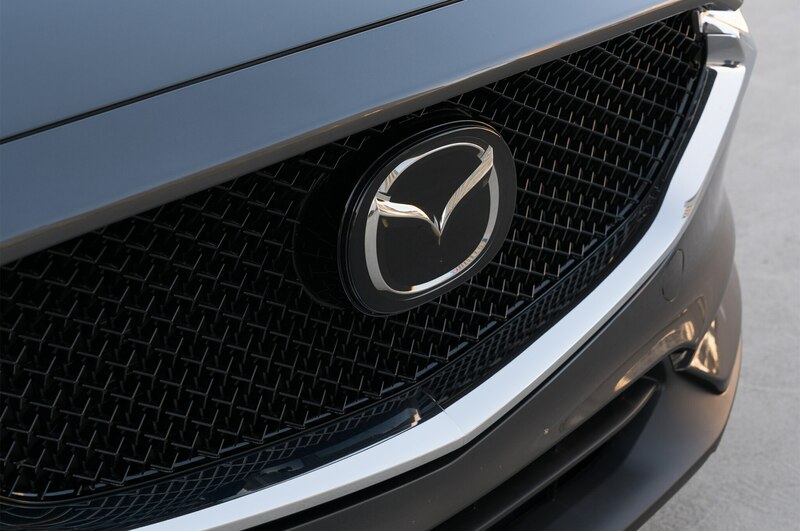 Those needing a bit more go won’t have to wait long as Mazda’s torquey 2.2-liter diesel I-4 will arrive in the second half of the year. 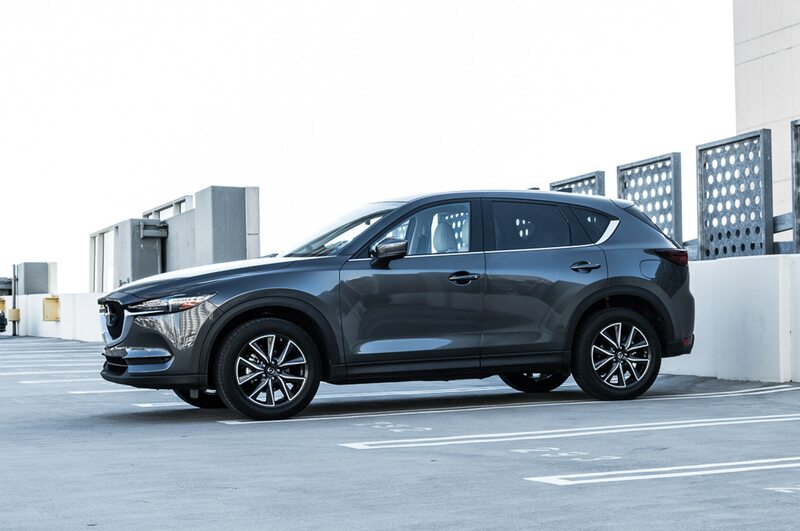 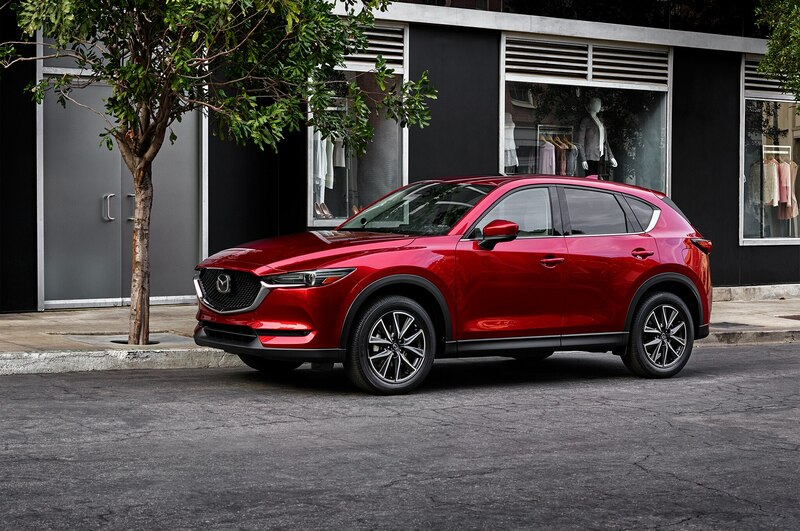 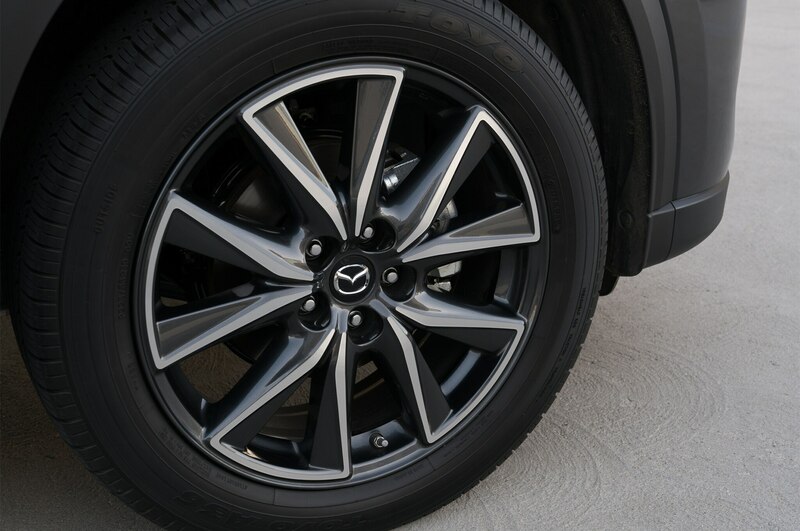 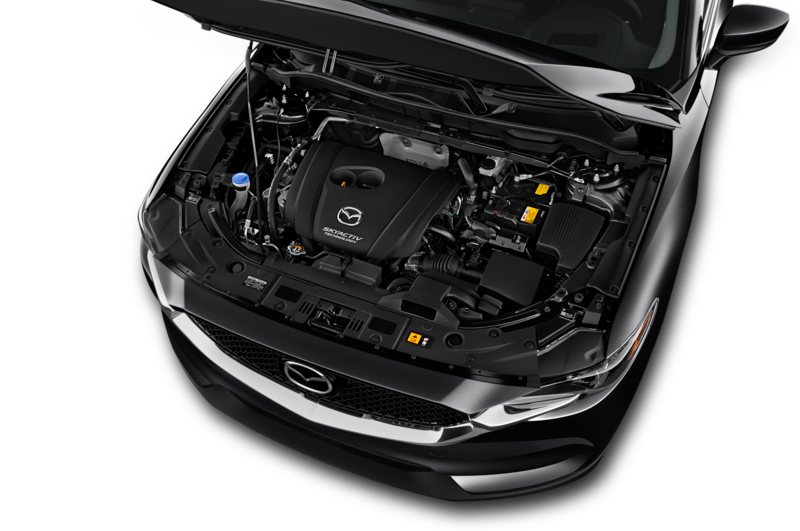 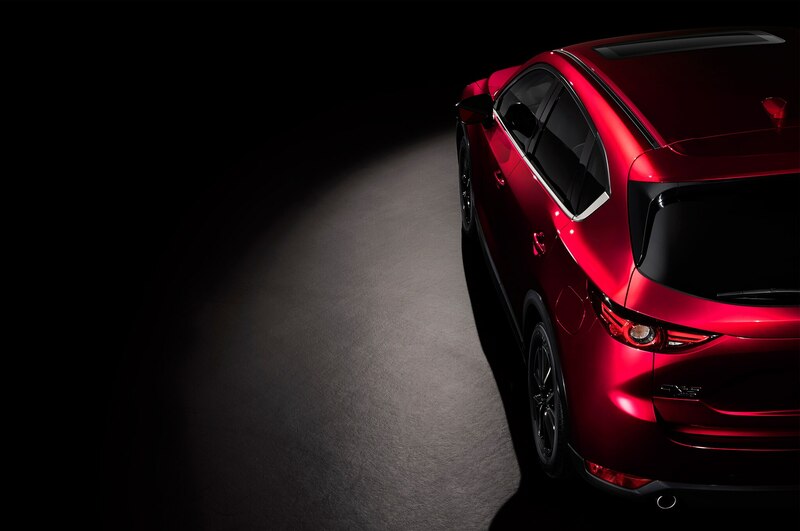 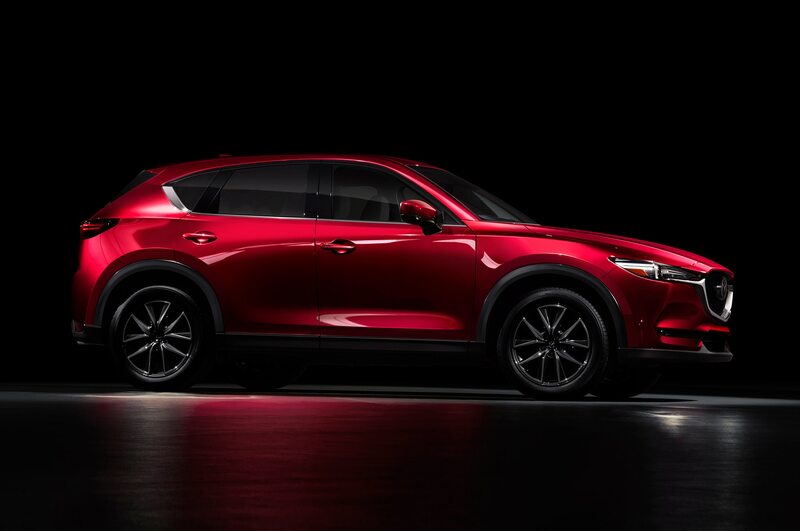 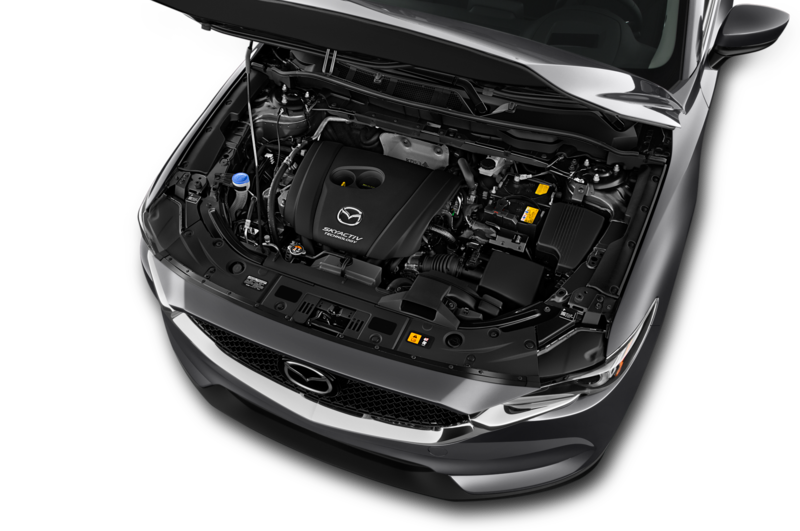 One of the primary goals Mazda had in mind when developing the new CX-5 was to achieve a significant reduction in NVH levels. 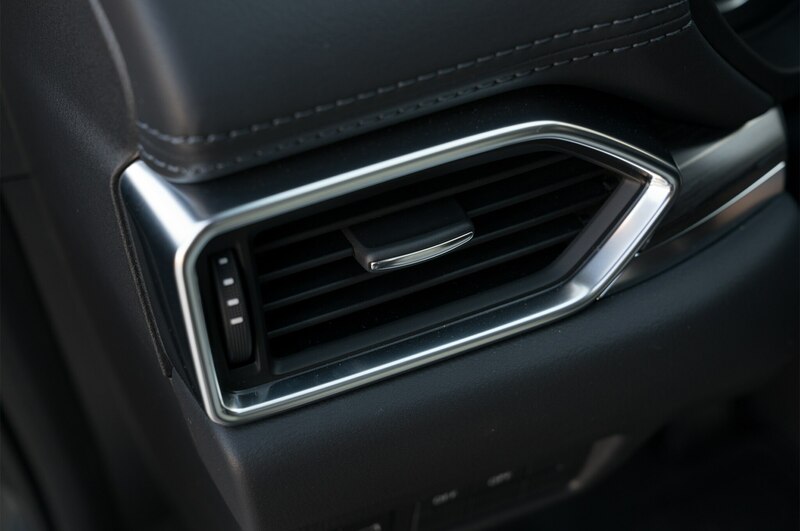 To accomplish this, engineers worked on a host of areas to help quell the racket in the cabin. 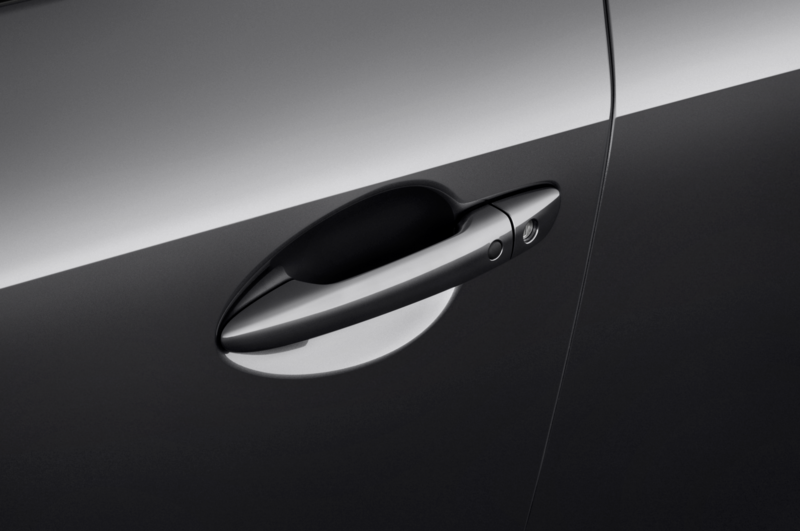 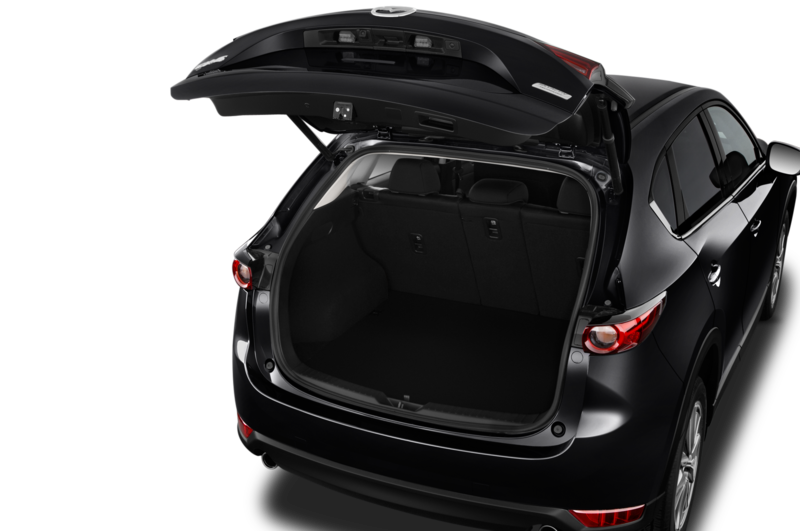 Among the updates: A third seal was added to the rear door and between the front and rear doors to prevent turbulence caused by the door gap; a deeper inner door seal was developed to better maintain pressure when forces pull the door away from the body; an additional seal was added to the tailgate; an uninsulated pocket in the cargo floor was closed off; acoustic glass was added to the front side windows; interior insulation was improved, and the suspension optimized. 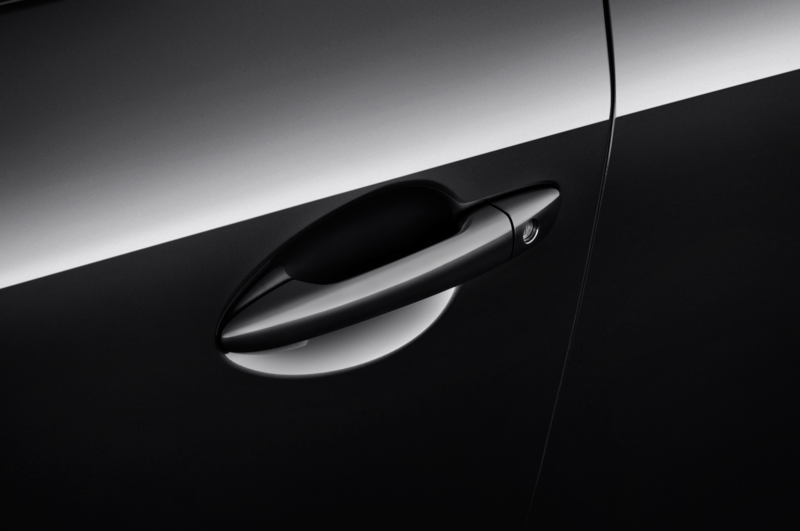 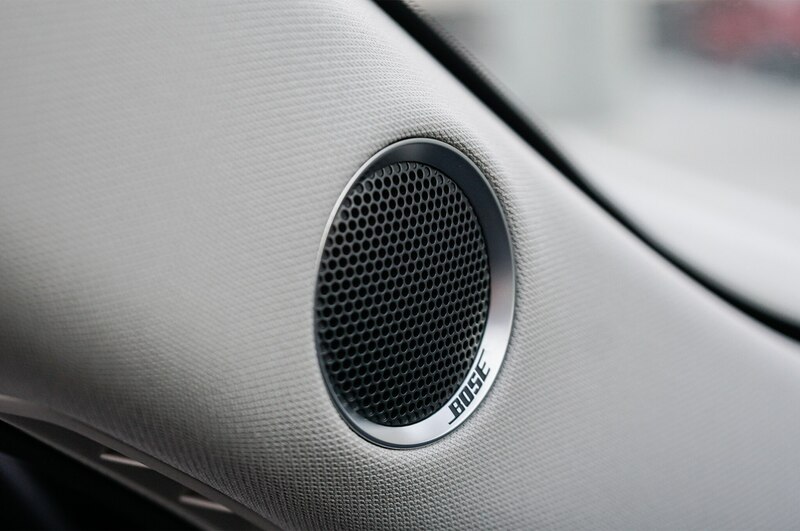 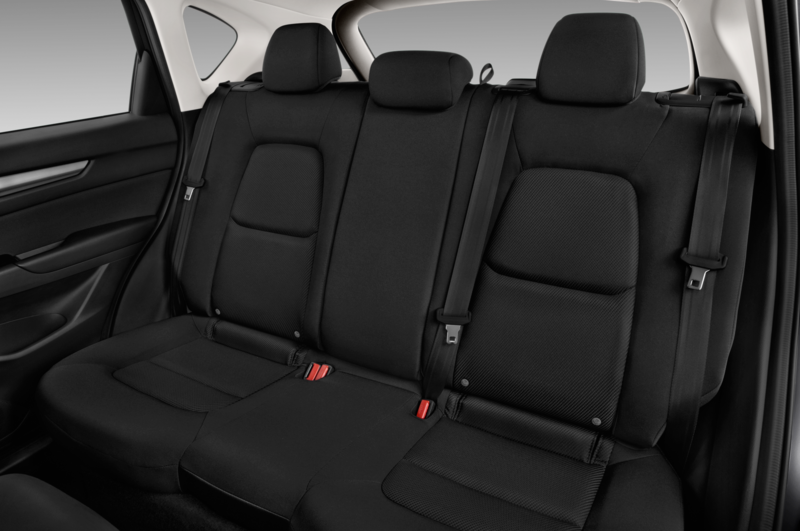 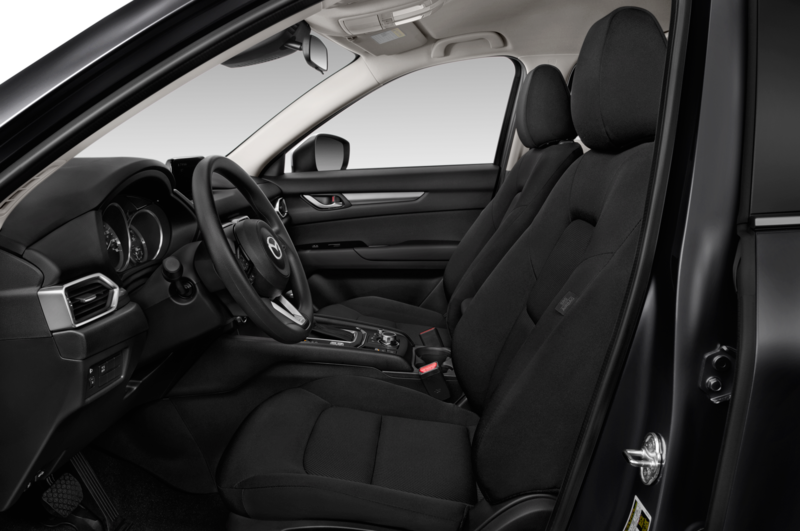 The result is a whisper-quiet interior even at freeway speeds, thanks to the near-elimination of high-frequency noises. 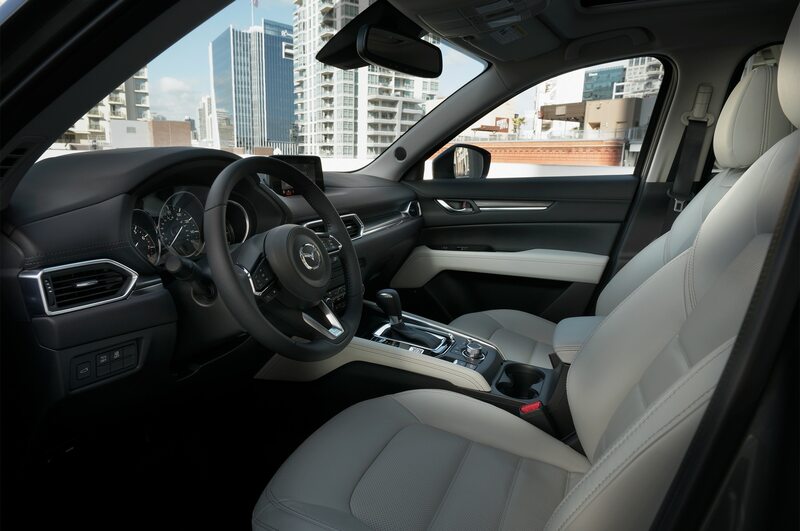 In addition to being quiet, the new CX-5’s cabin is also quite pleasant. 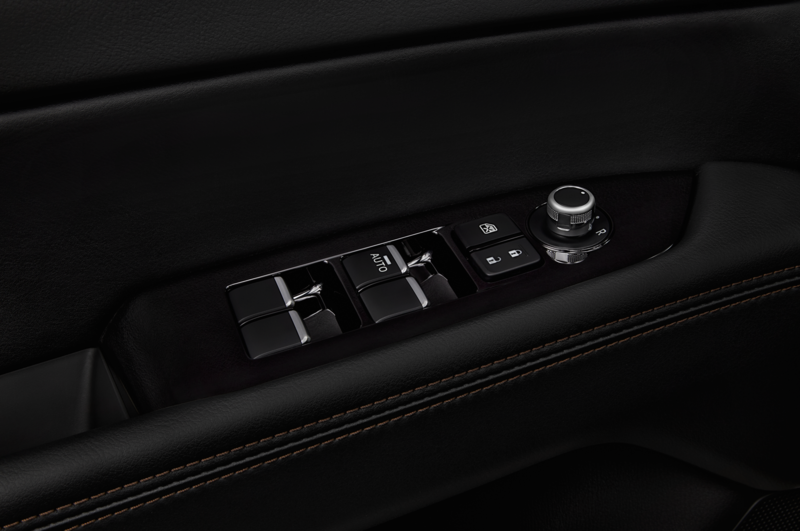 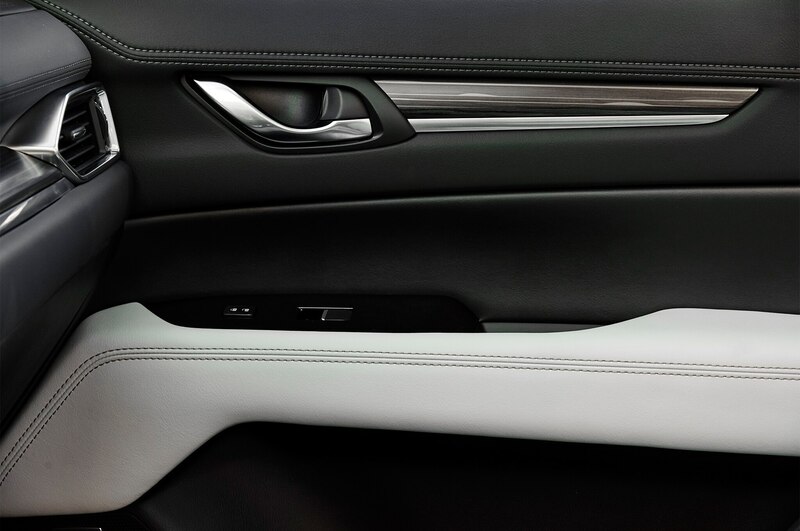 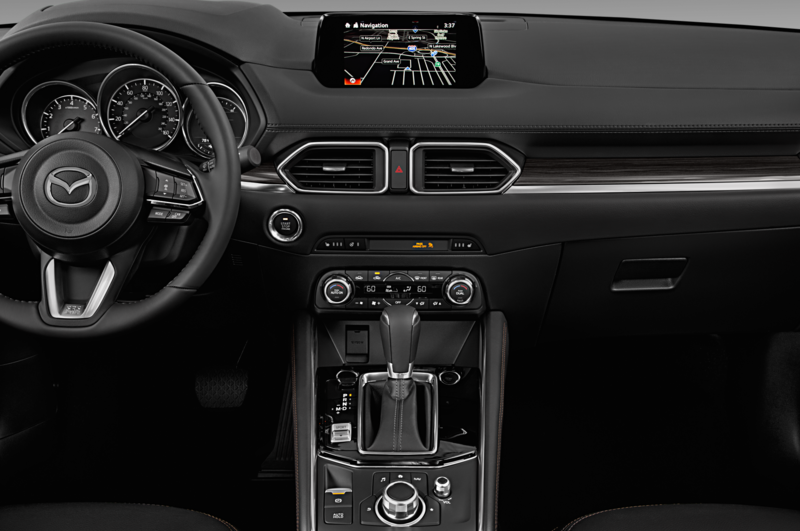 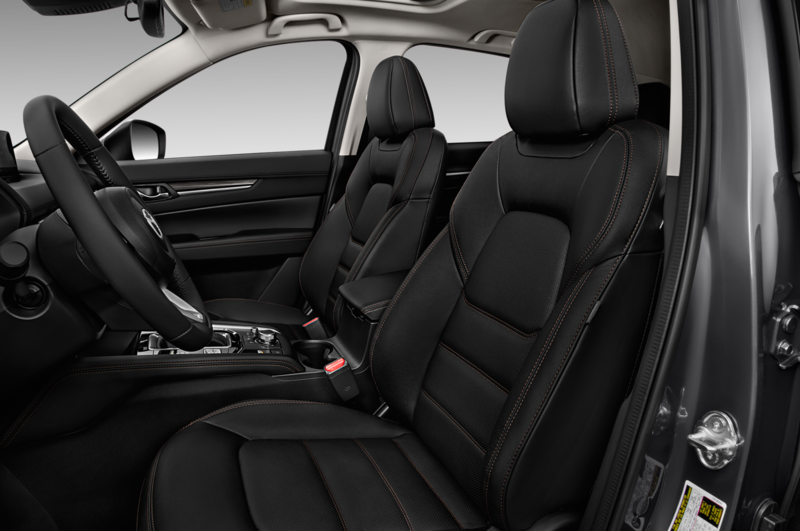 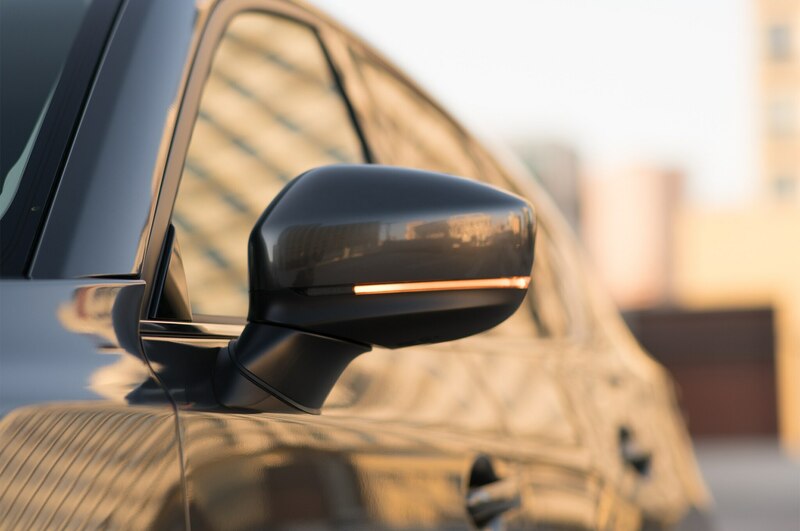 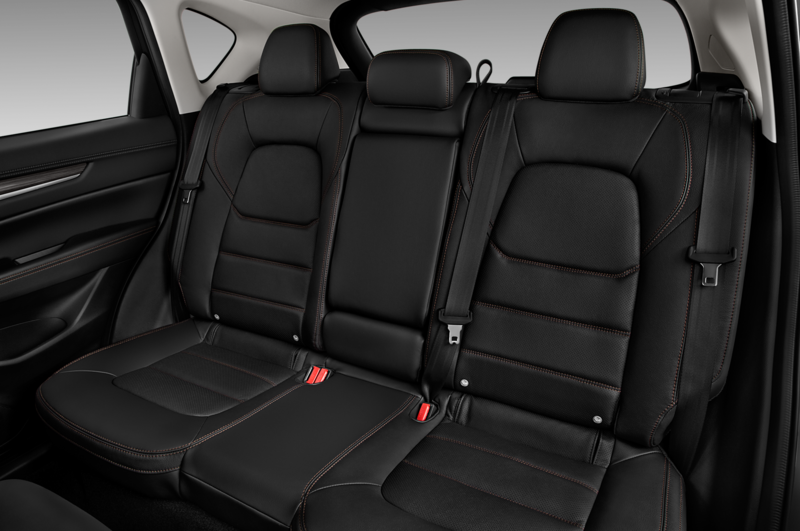 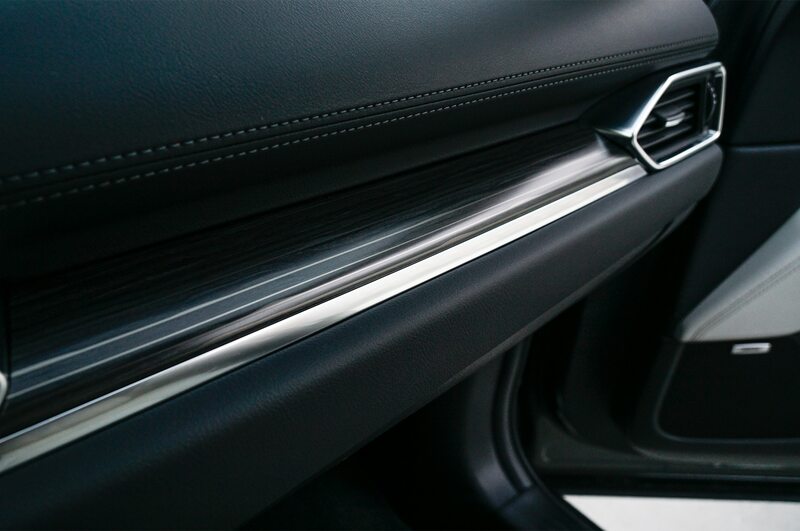 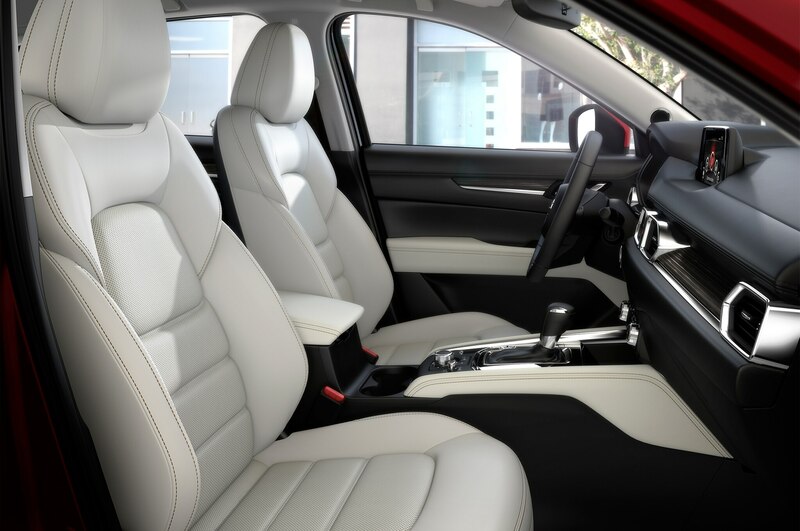 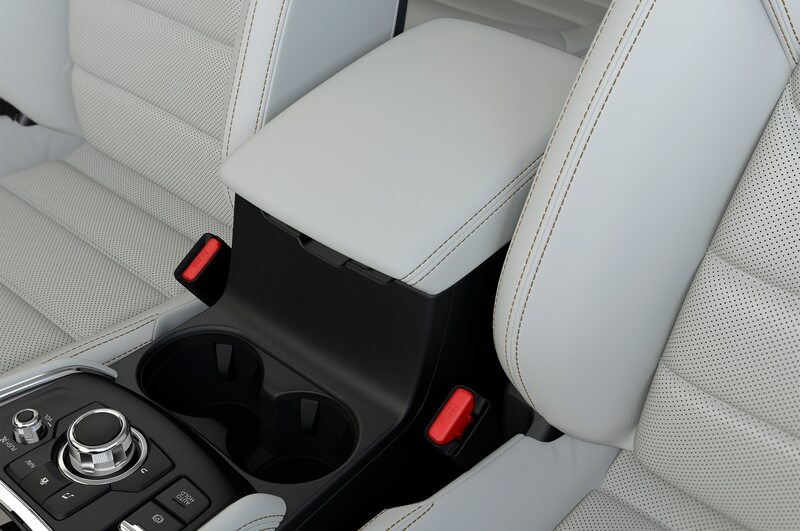 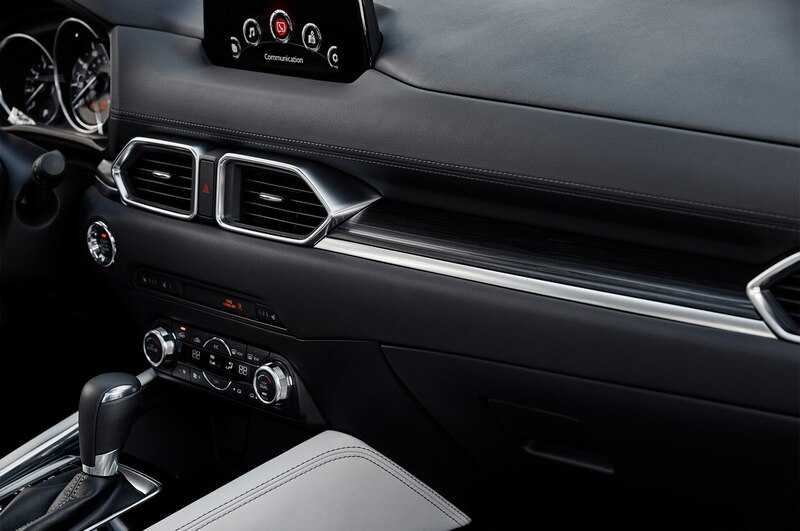 Designers eliminated more than 20 elements that created “visual noise” from the outgoing CX-5’s interior and made more extensive use of premium materials. 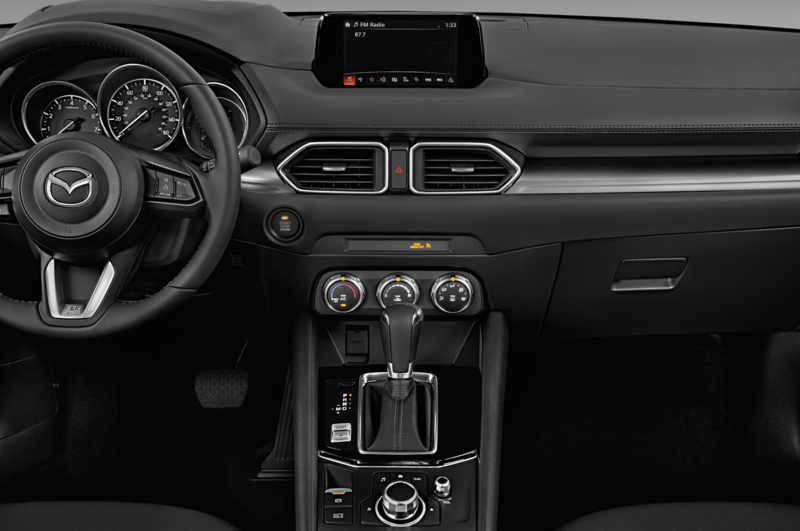 Controls are intelligently laid out, ergonomics are as good as they come, and there’s plenty of leg and headroom for tall individuals. 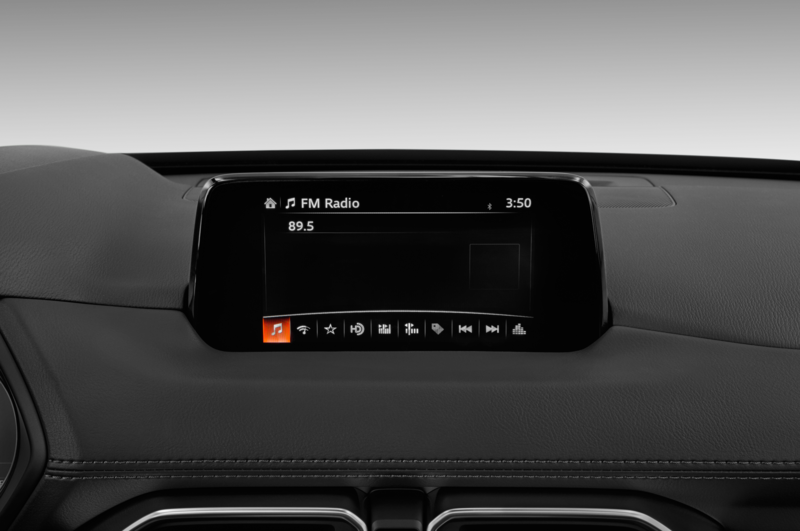 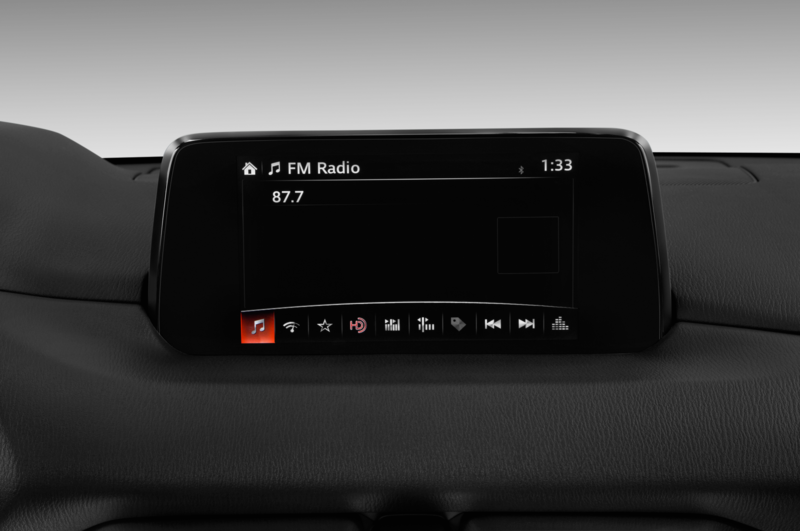 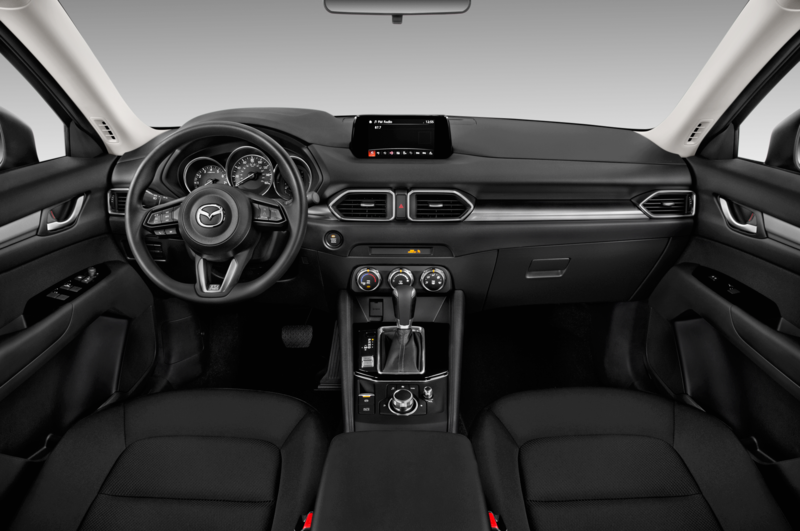 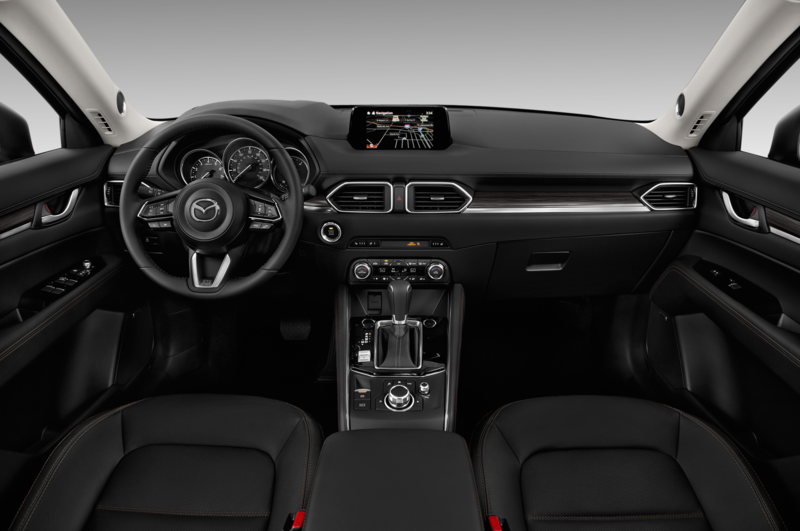 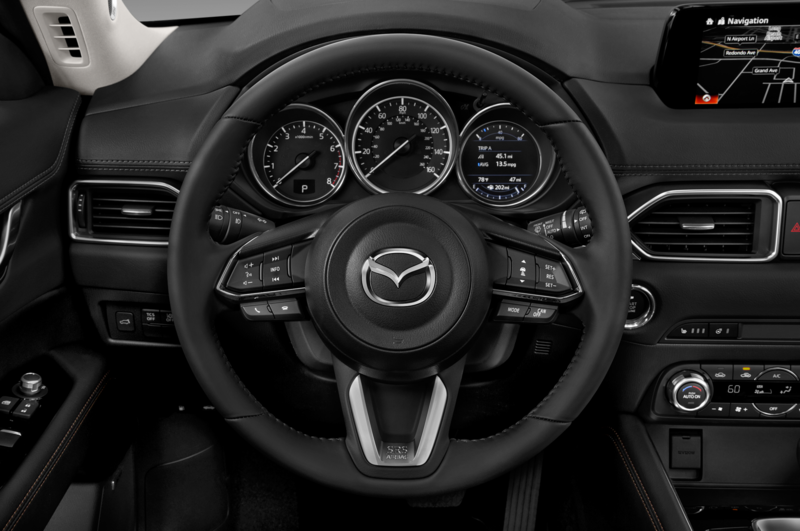 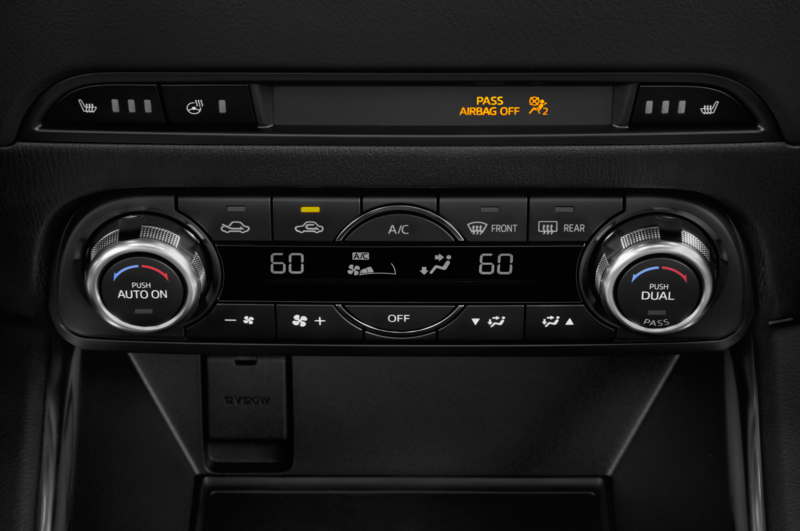 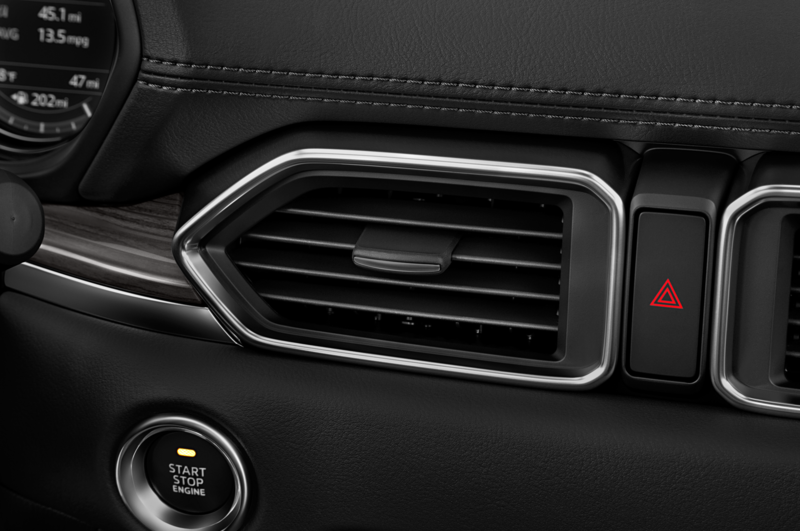 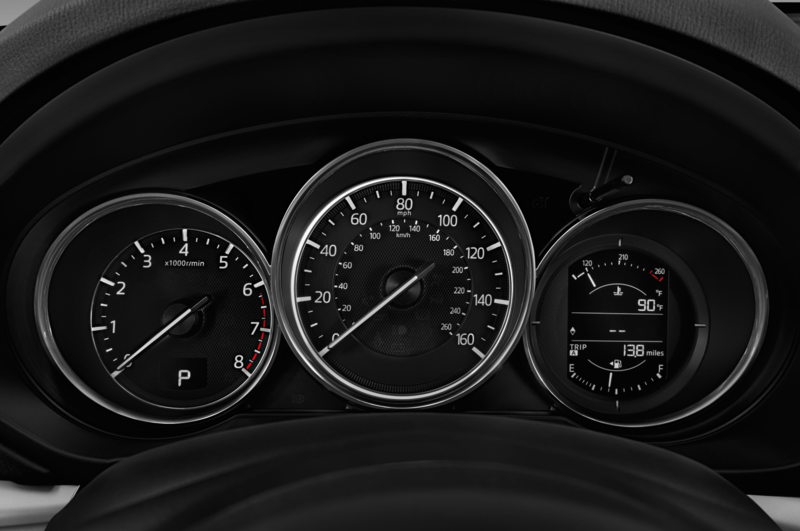 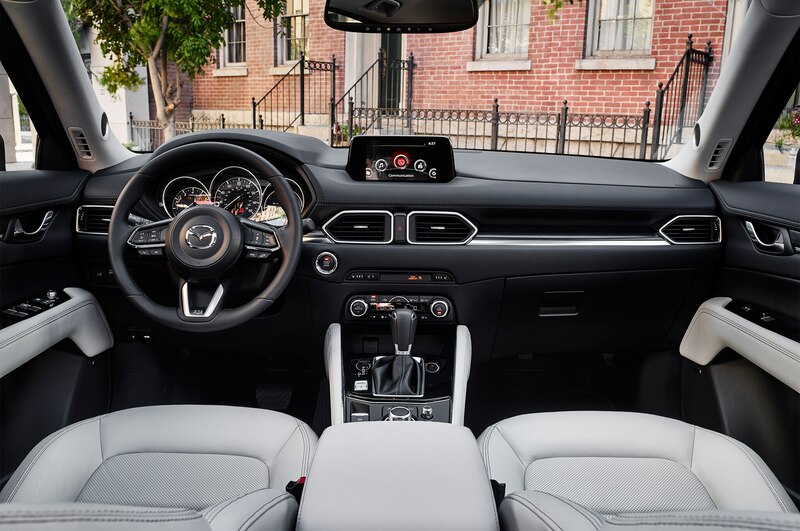 One interesting choice Mazda made was to segregate infotainment and driving information, with the former limited to the center stack and the latter concentrated in the gauge cluster. 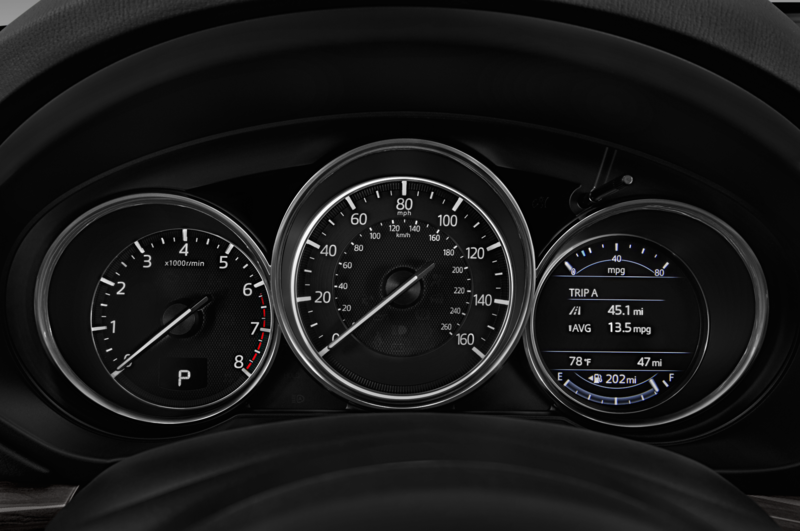 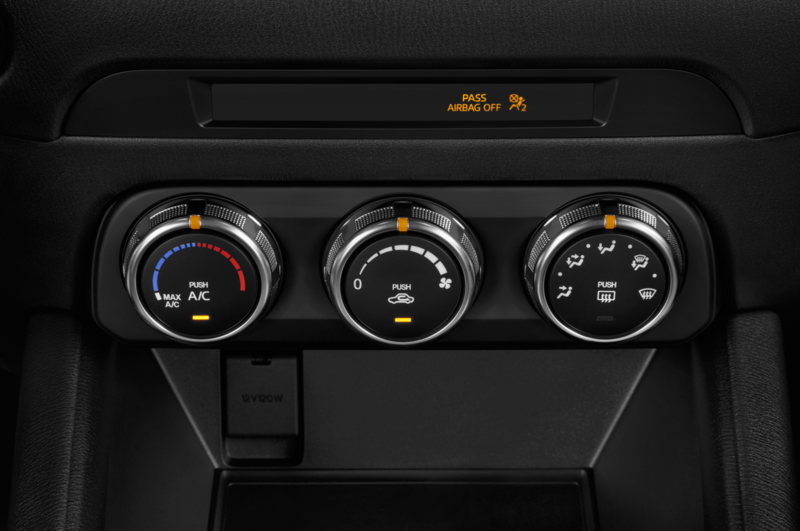 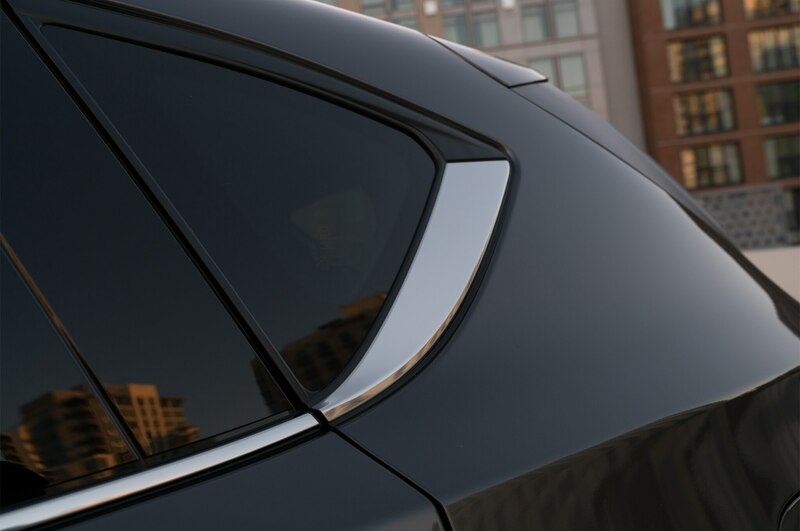 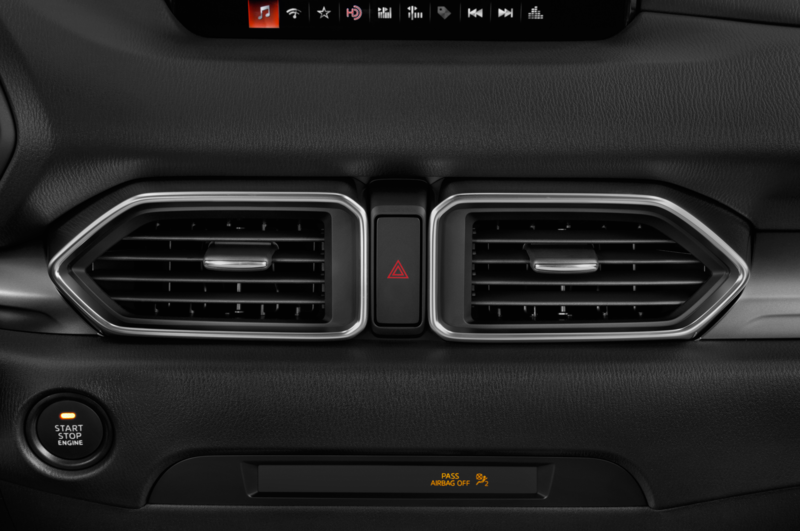 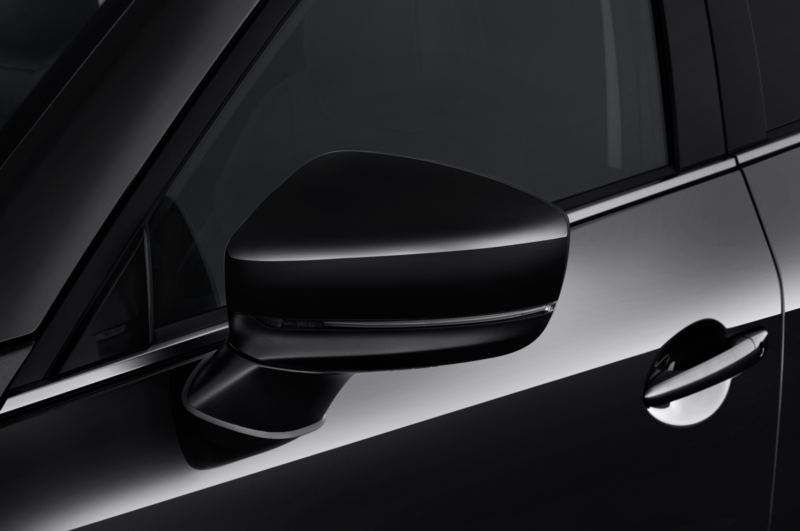 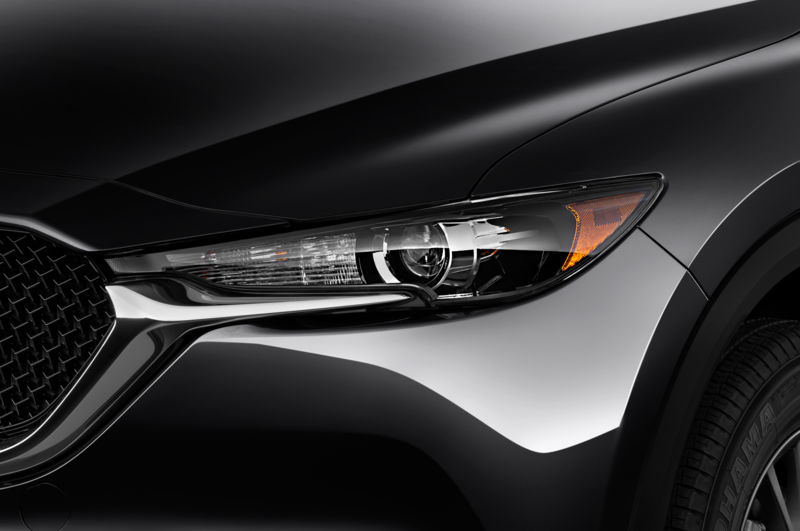 On Grand Touring models equipped with the Grand Touring Premium Package, the head-up display now projects on the glass instead of a small plastic lens atop the dash. 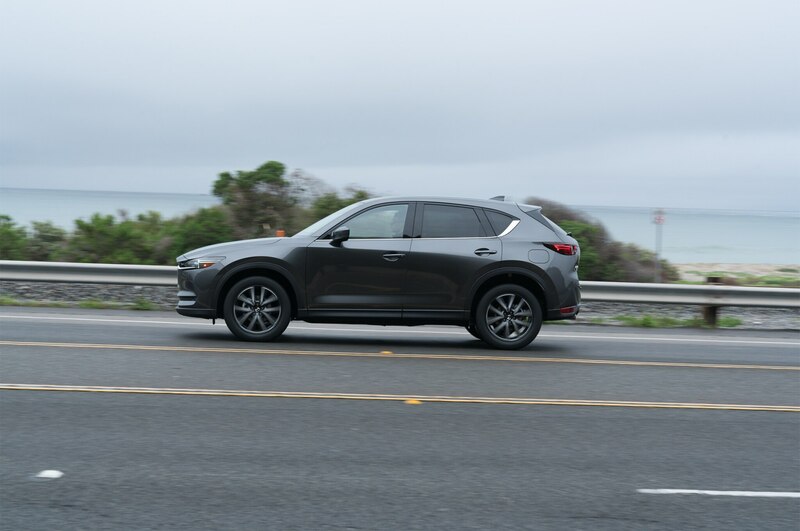 Our drive loop took us through much of the South San Diego County countryside, where we got to experience a wide variety of pavement and turns (most of them unbanked or off-camber) while driving amongst unusually green hills. 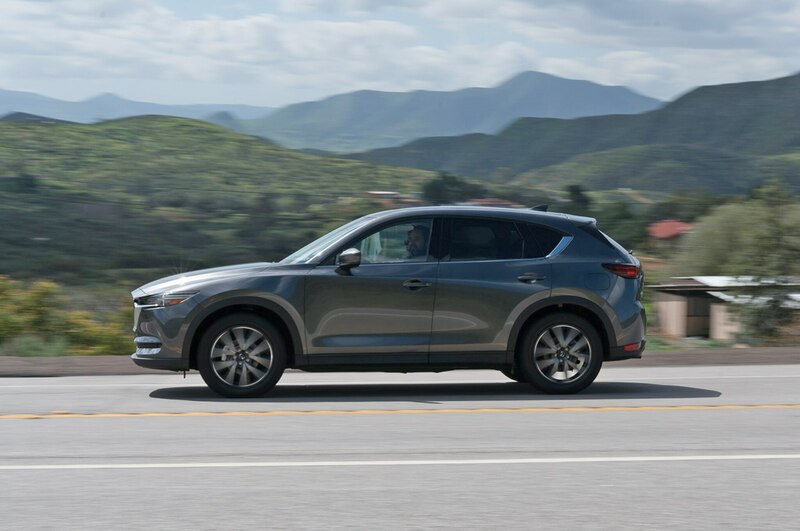 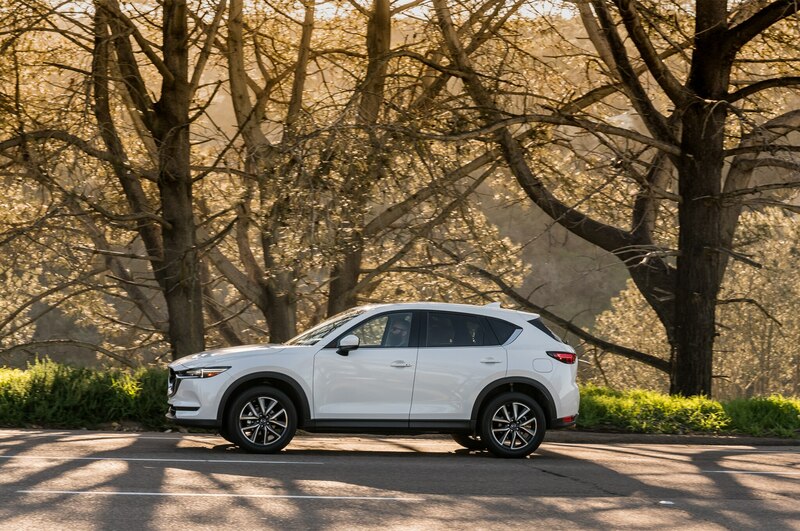 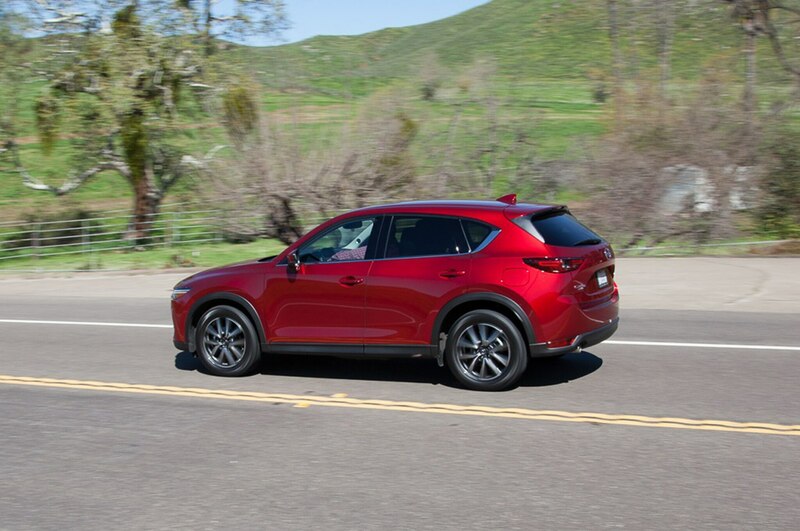 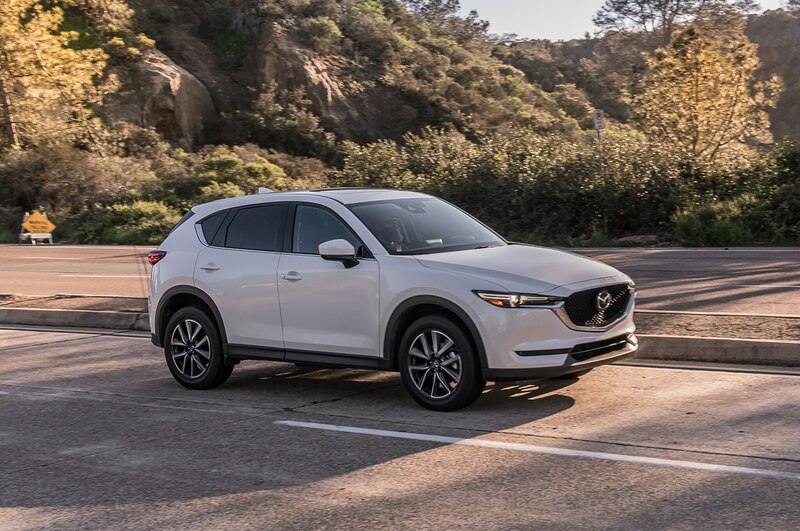 The CX-5’s quiet demeanor was unfazed by rough and broken pavement, but the turns challenged the suspension, causing it to exhibit more body roll than expected, especially when traversing one of the aforementioned off-camber corners. 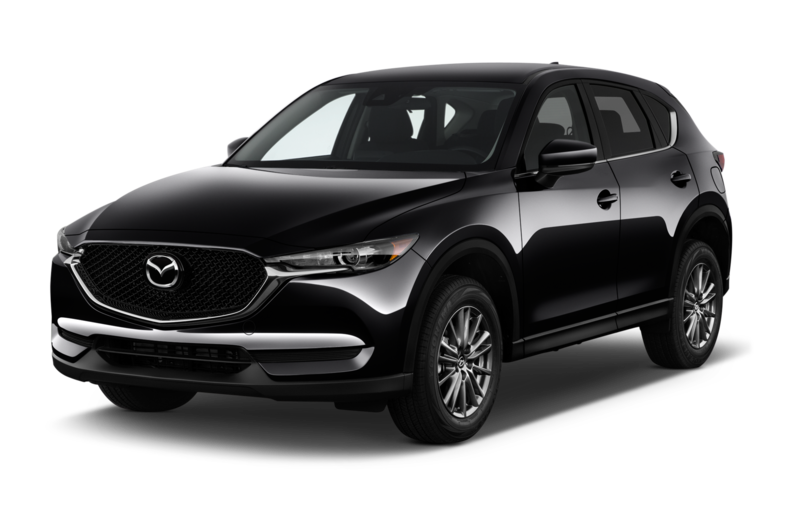 That said, the CX-5 still handled matters better than softer competitors like the Toyota RAV4 or Honda CR-V likely would have. 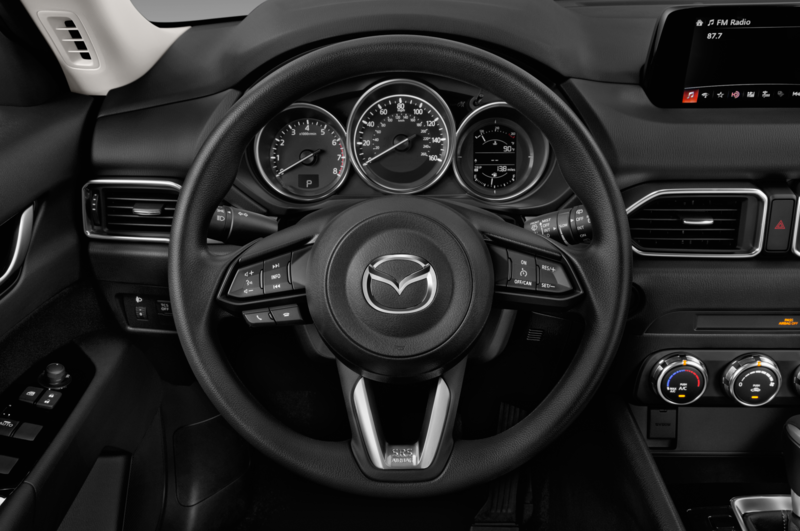 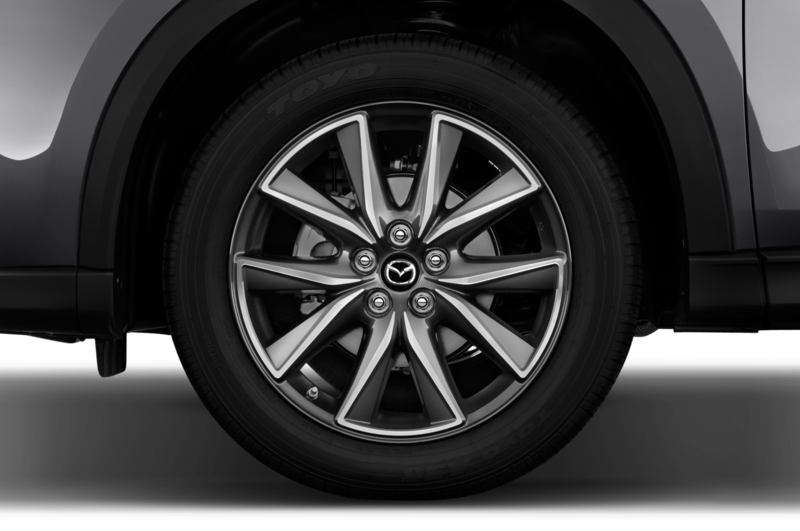 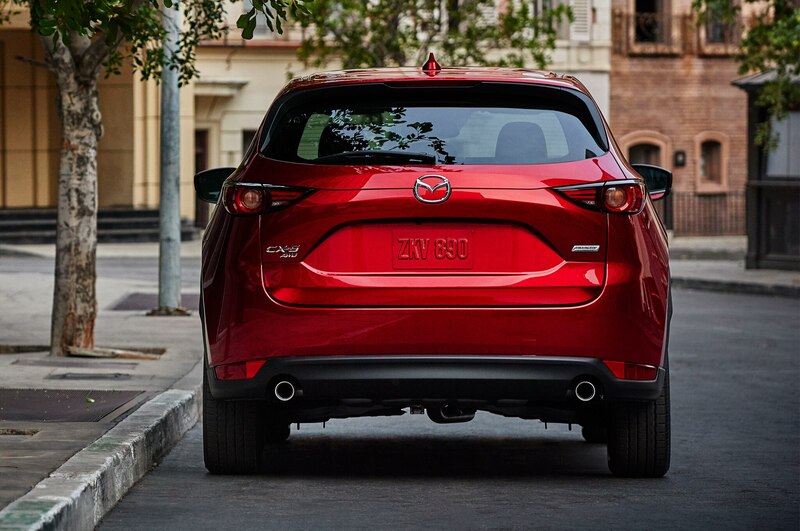 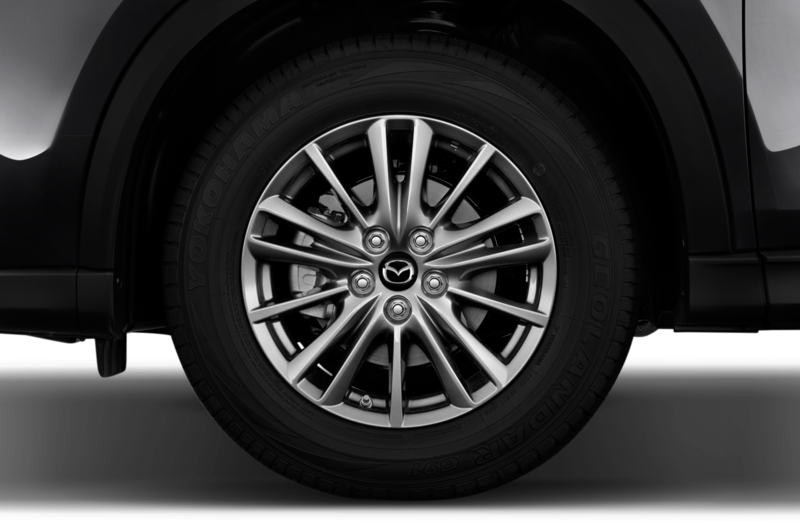 Steering is as direct, responsive, and linear as you’d expect a Mazda to have, if not more so. 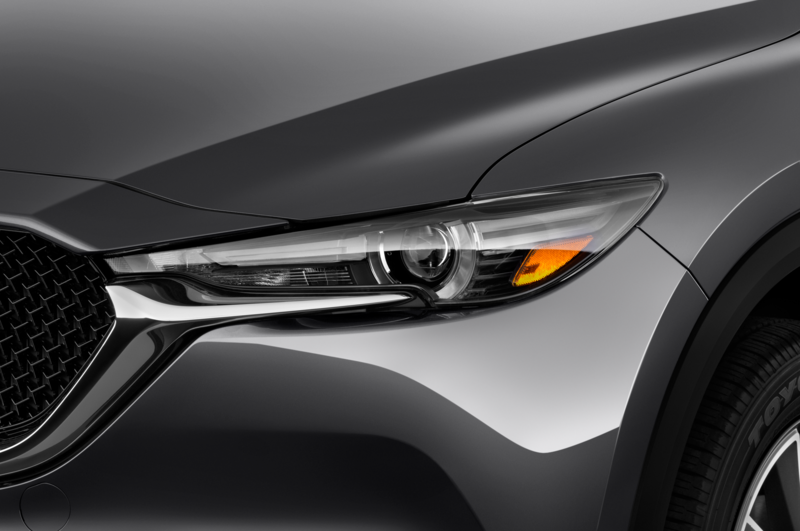 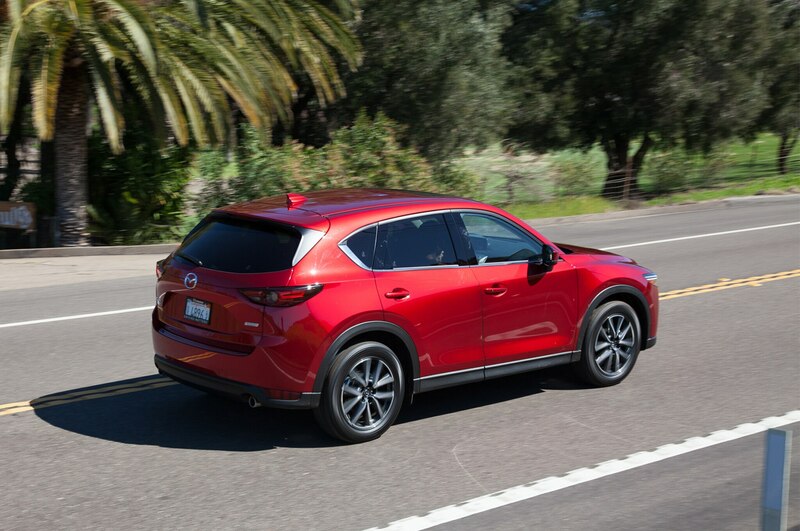 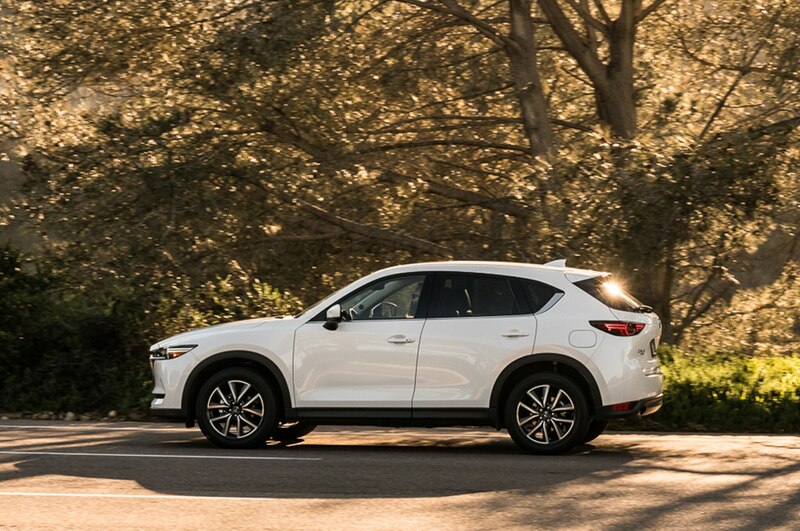 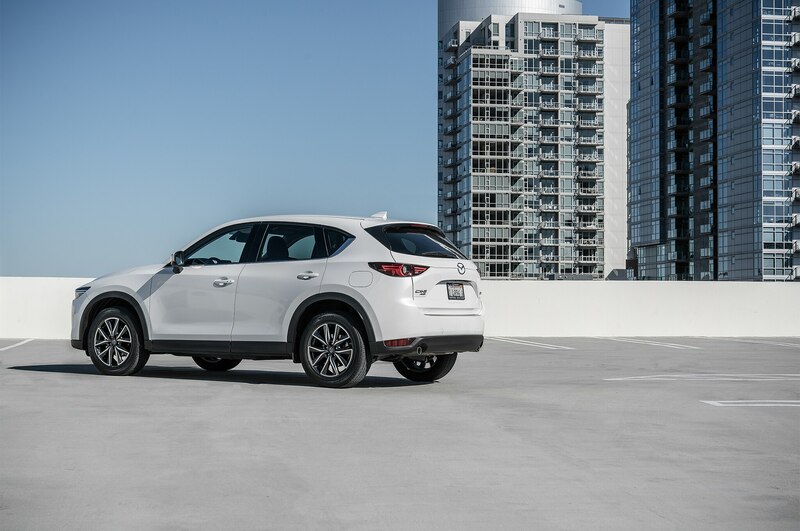 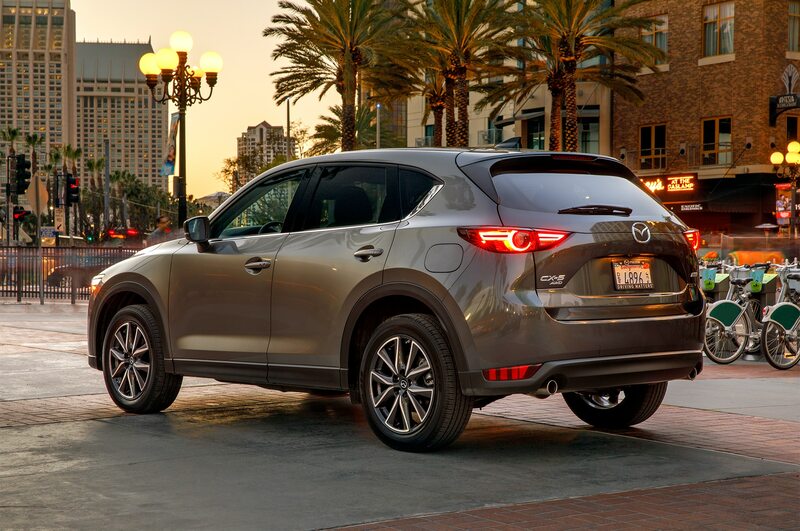 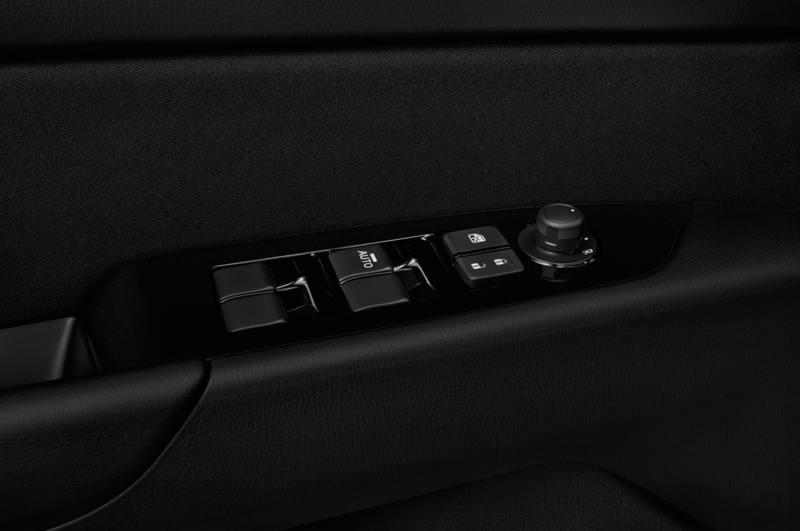 The 2017 CX-5 uses a rigid-mounted steering rack with fluid-filled control arm bushings, which provides better response at higher lateral Gs while reducing vibration. 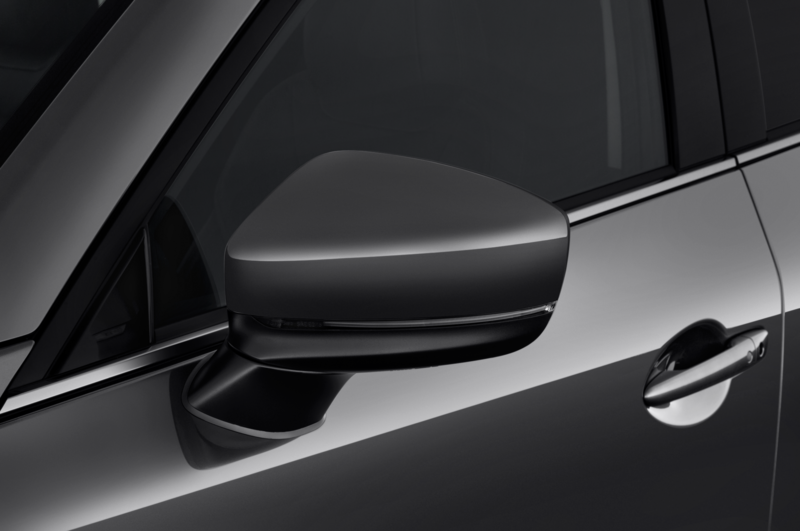 Engineers also adjusted spring perch angles to more accurately cancel side loads, which helps smooth out handling. 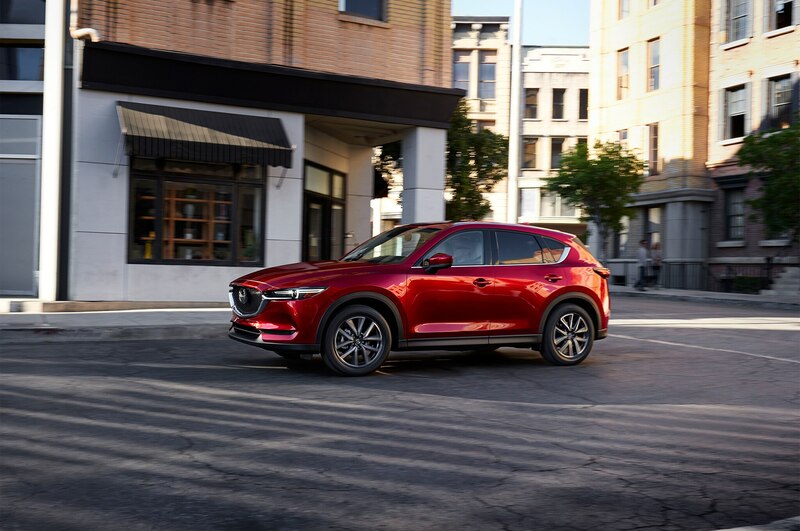 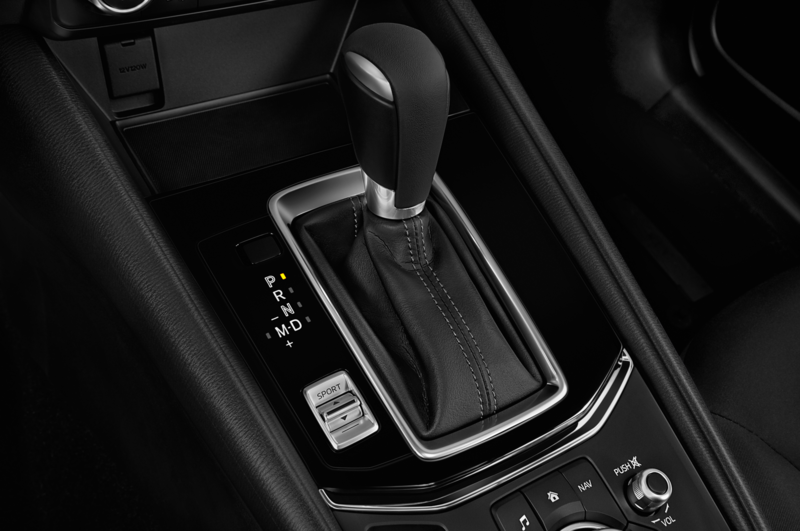 Mazda’s new G-Vectoring control also improves turn-in by pulling just enough engine torque when the wheel turns to shift weight forward and increase the front contact patch. 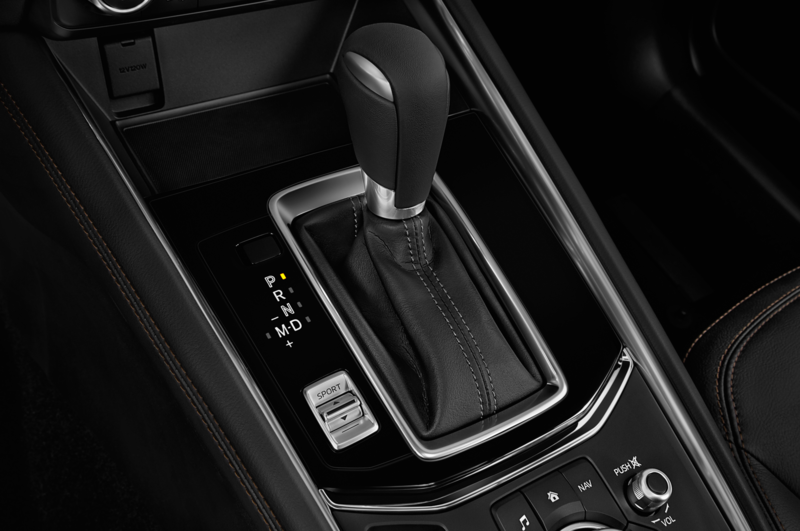 However, as is the case with most electric power assist steering setups, feedback is minimal. 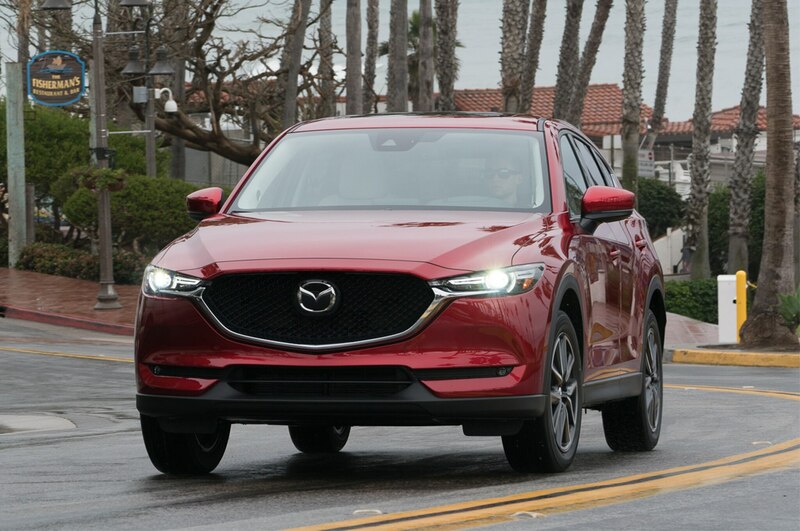 To provide some perspective — and, perhaps, firmly state its confidence in its product — Mazda offered up the opportunity to drive a few quick loops in a handful of competitors after we completed the main route. 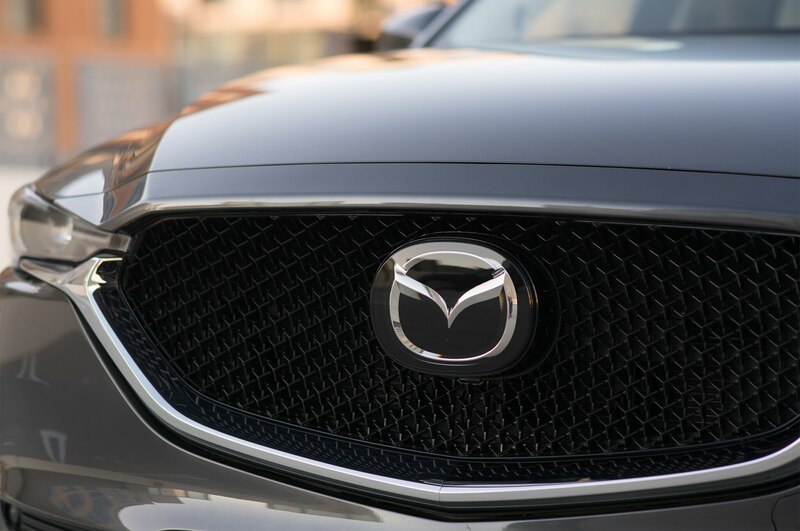 But these weren’t direct competitors — these were luxury offerings. 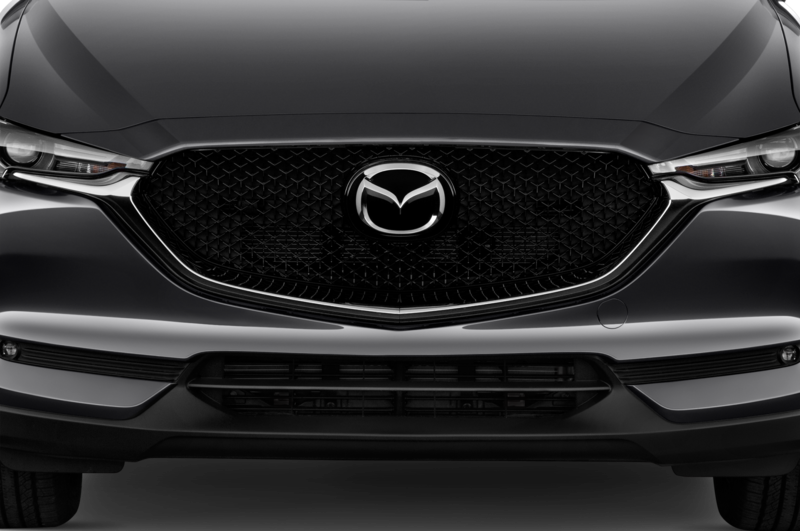 After spending time in the Audi Q3, Mercedes-Benz GLA, BMW X1, and Lexus NX on hand (all of which were north of $40,000 as equipped), my drive partner agreed that even though the forced-induction-equipped competitors would all thoroughly dust it, the Mazda didn’t give any ground in the feature set (especially now that Mazda offers adaptive cruise control that works all the way down to a complete stop), offered a quieter interior than all but the Lexus, and provided better throttle response. 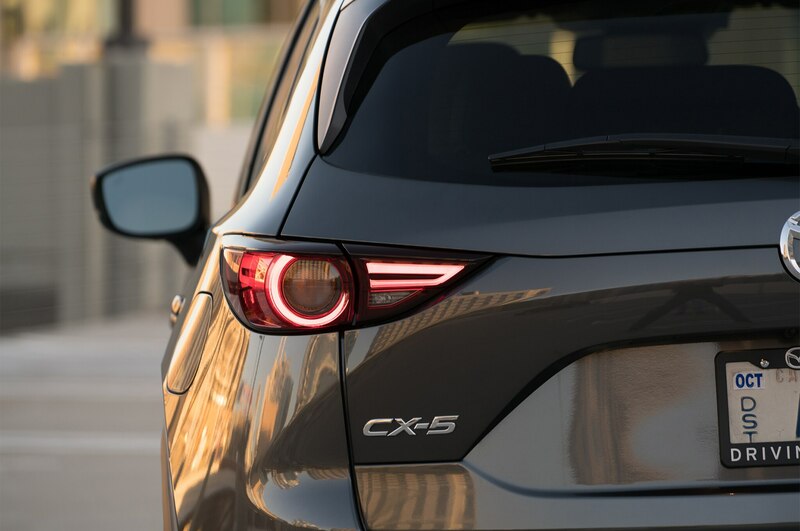 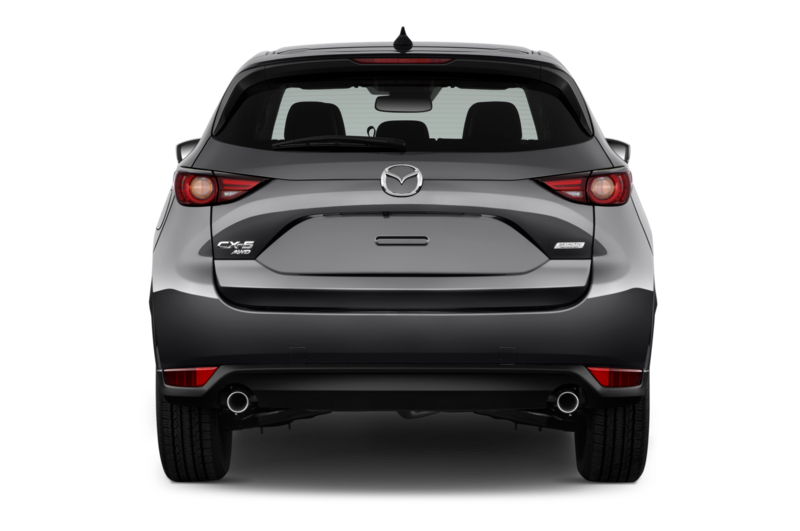 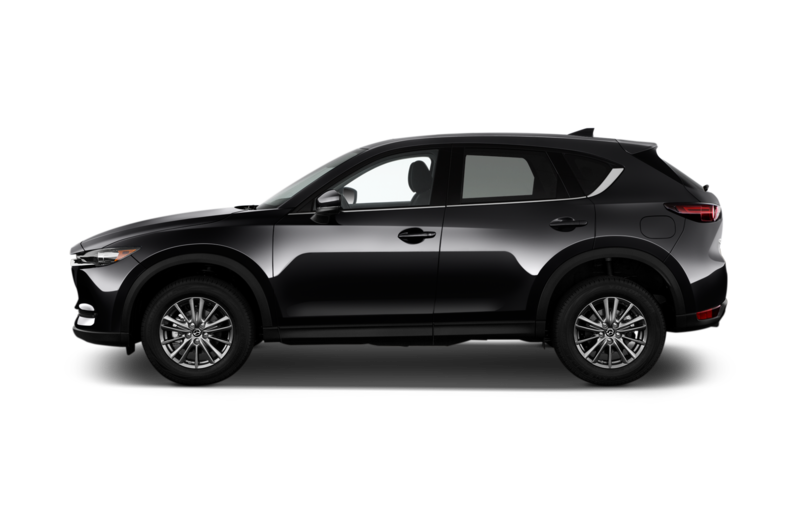 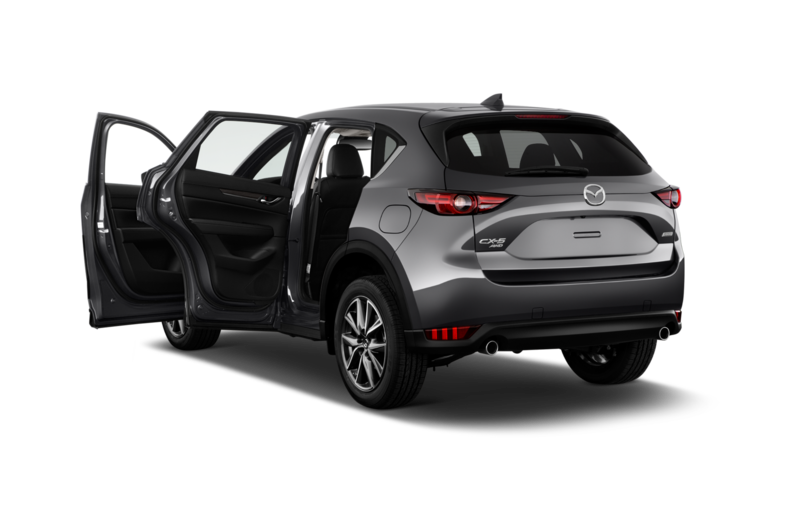 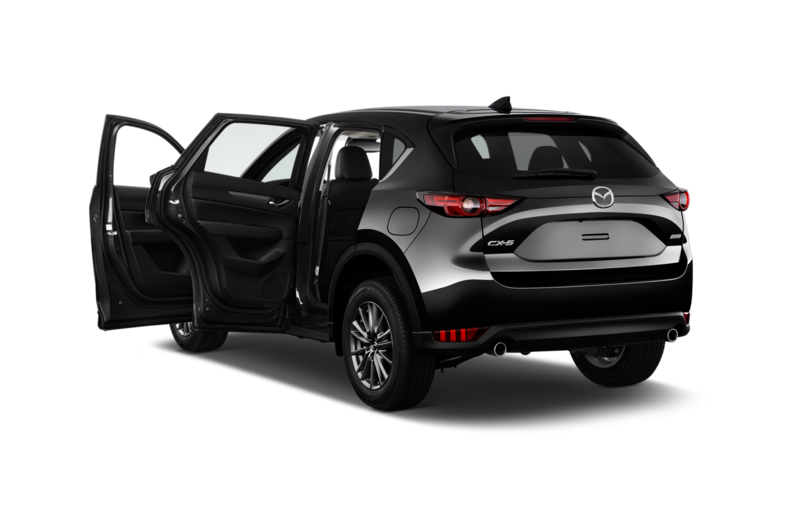 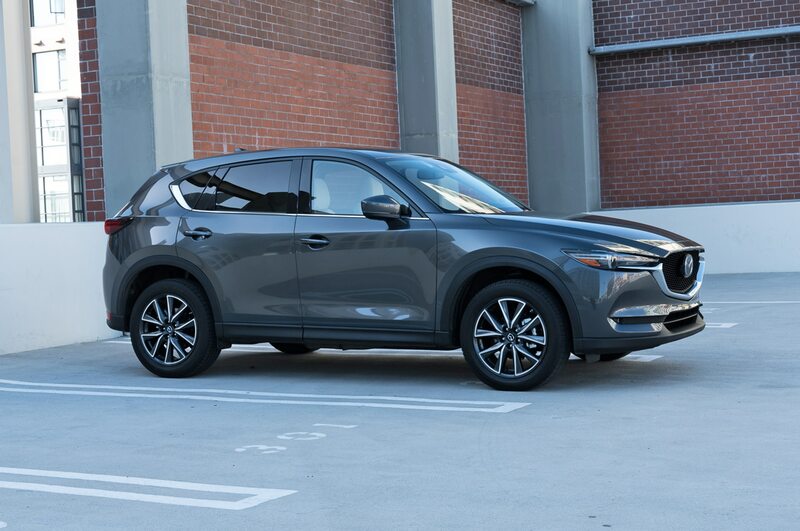 In all, although it could use more power, the 2017 CX-5 should be an even bigger hit for Mazda than the outgoing model. 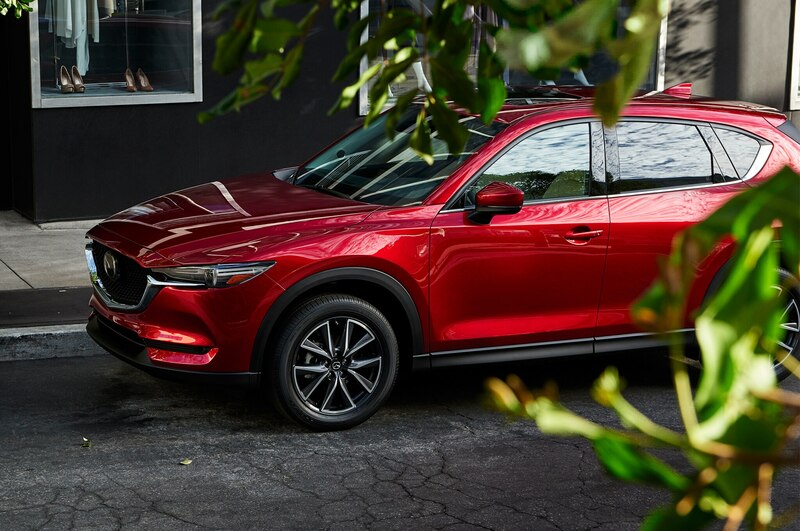 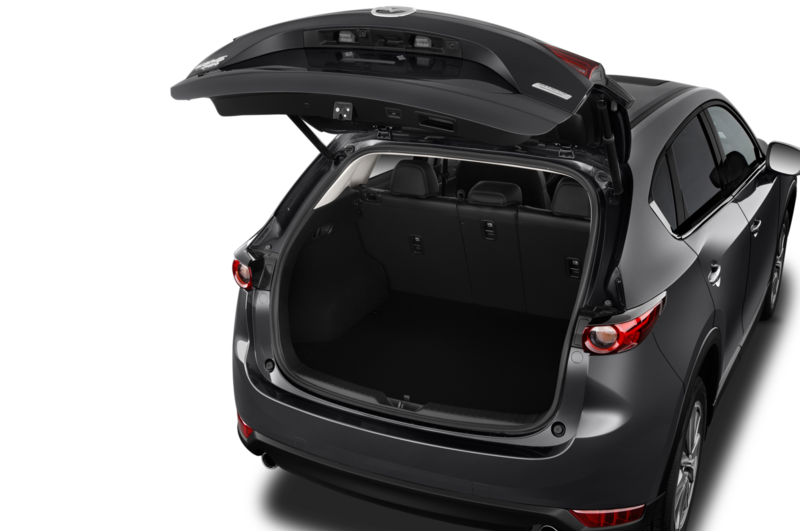 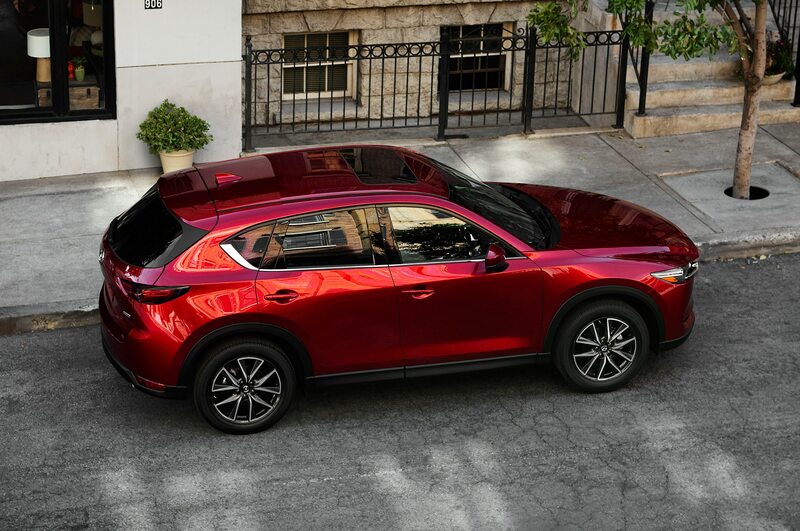 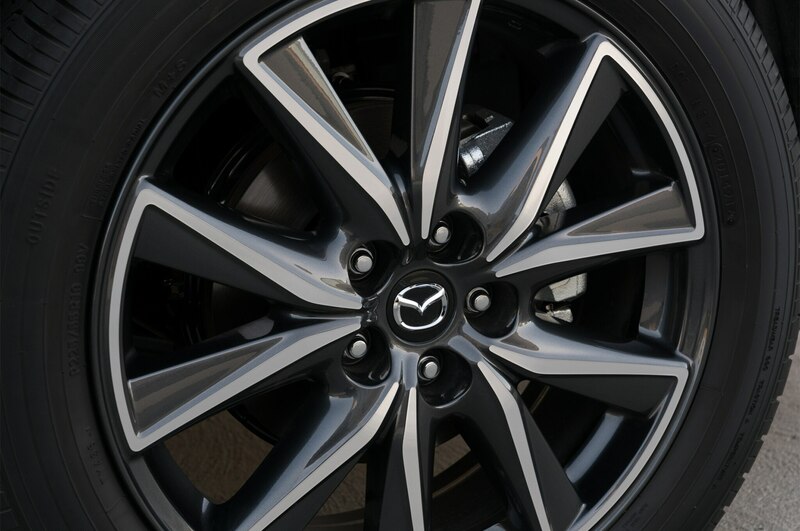 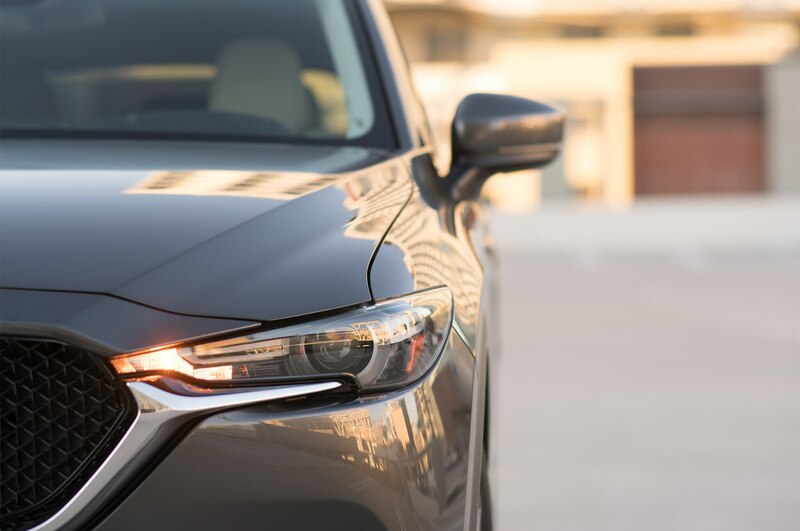 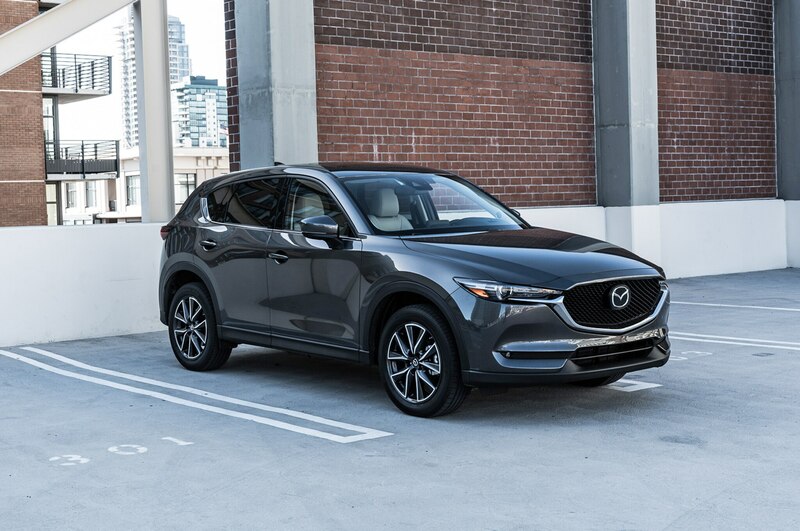 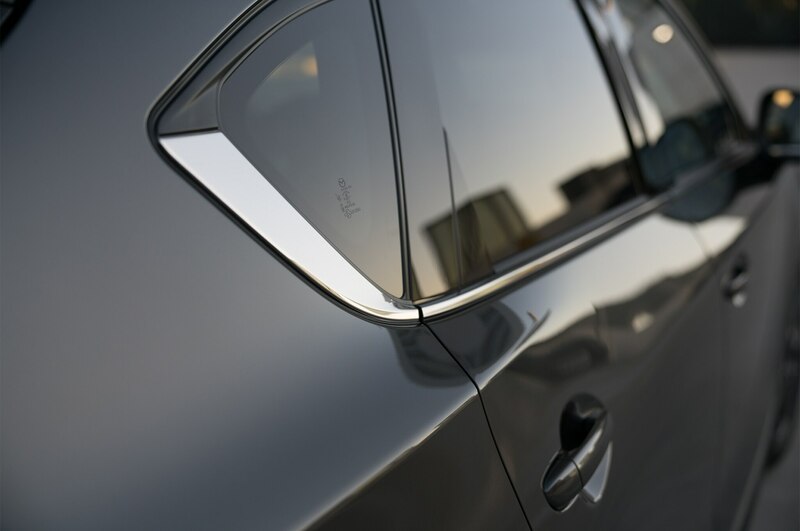 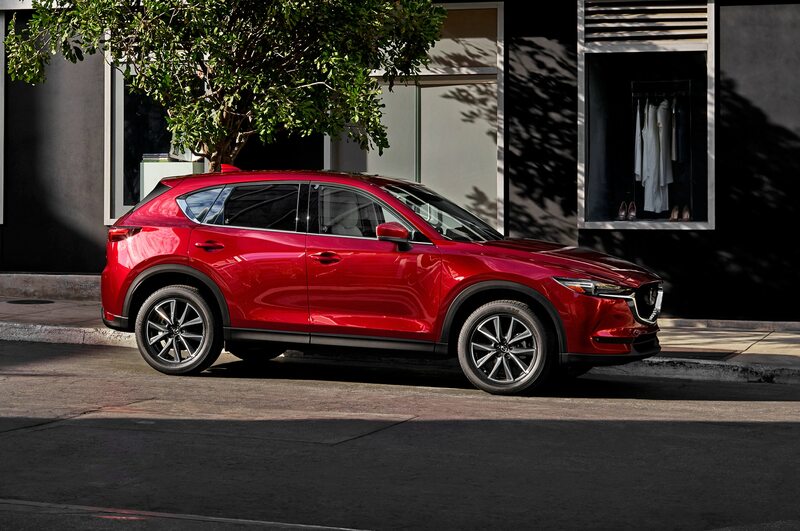 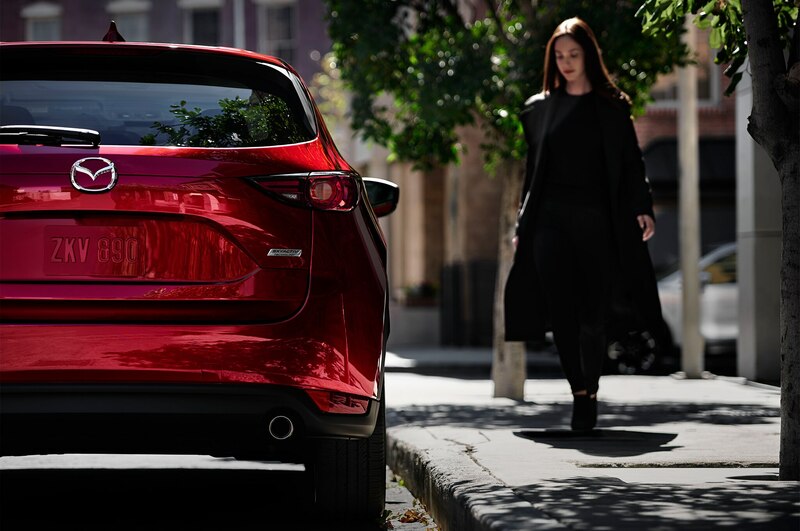 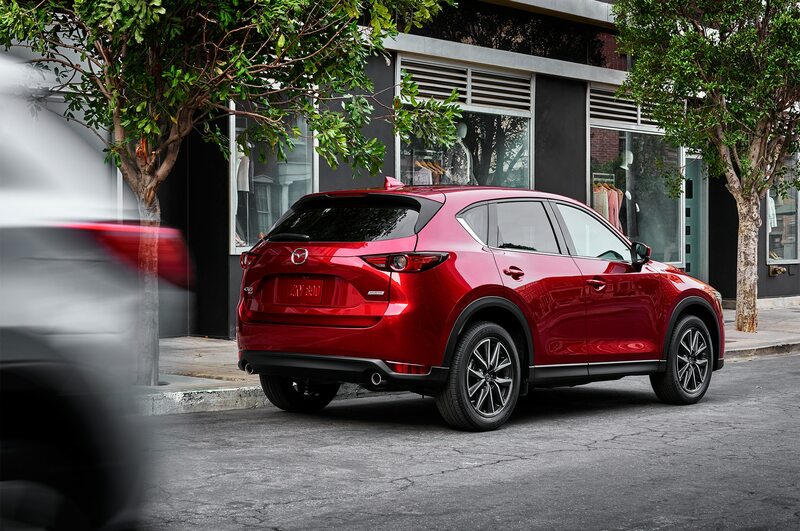 It offers premium style and packaging at a non-premium price with the added bonus of Mazda’s satisfying driving dynamics. 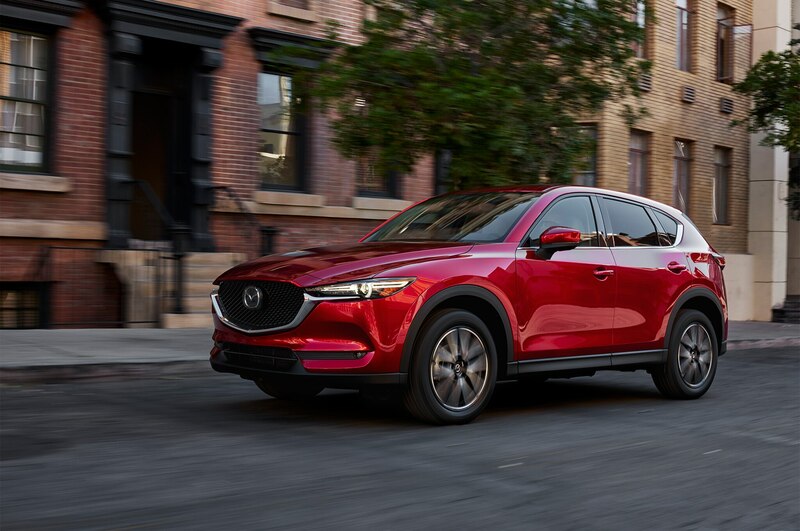 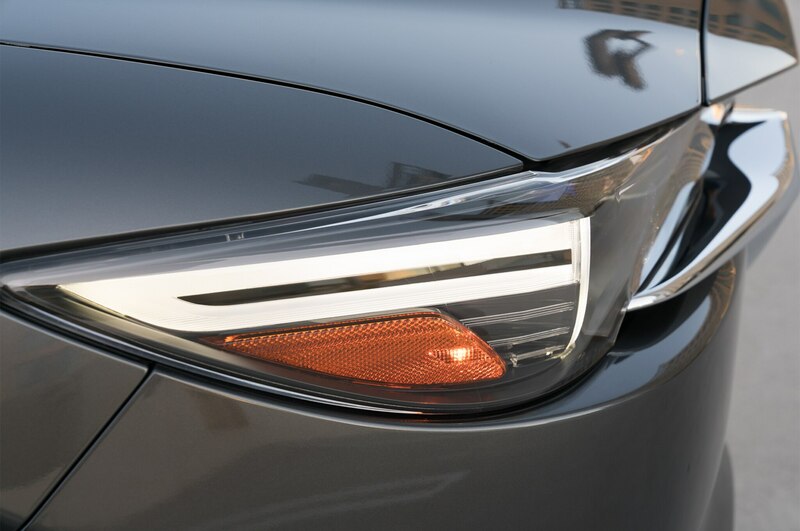 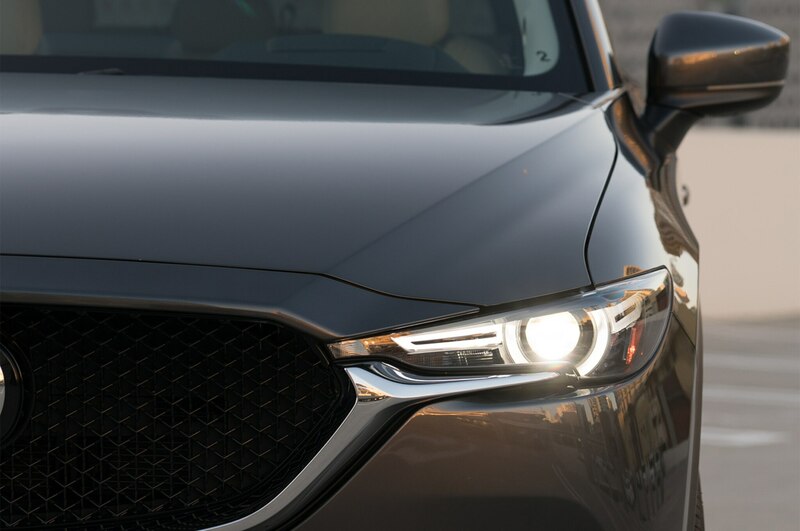 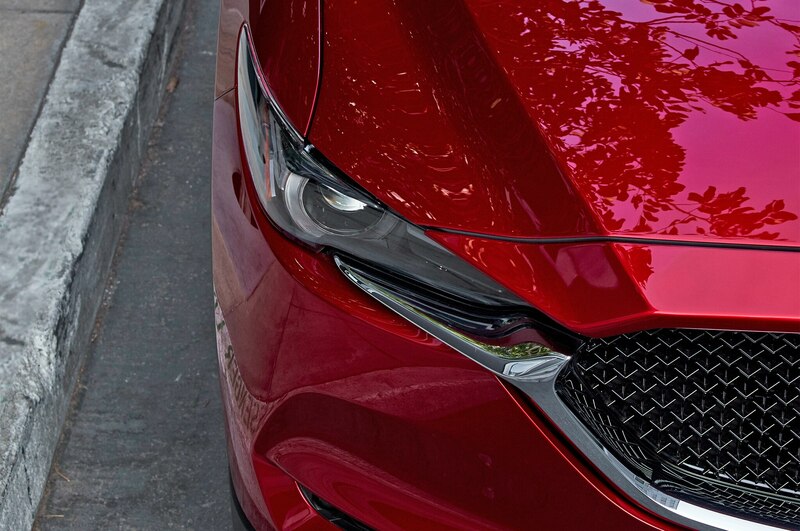 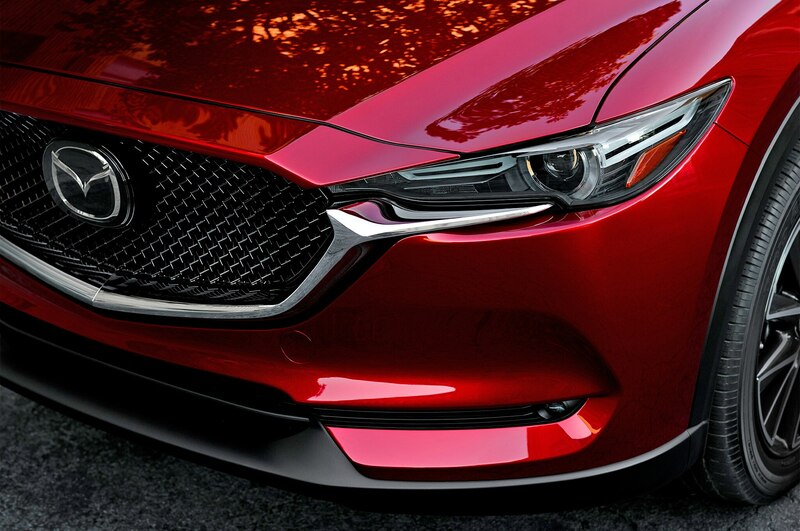 It’s a fully on-brand product that also pushes the Mazda forward and is sure to satisfy all but the most power-hungry buyers.